Long, relatively boring, and windy. From here, 2536 kilometers to Buenos Aires. 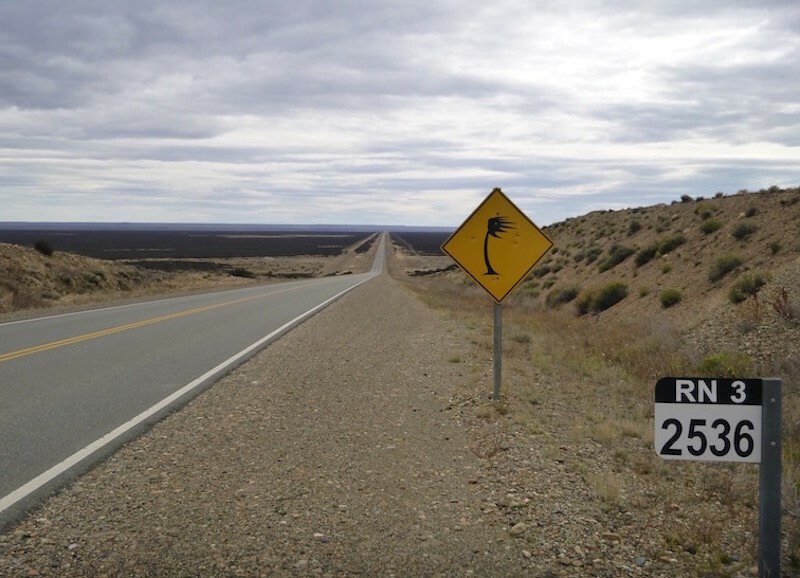 It’s the most direct way up to Buenos Aires. There are other ways, such as the way I came south, but it adds a lot of distance. And I now have a confirmed date to ship out of Buenos Aires, so it’s time to cover some ground. And once again, I stand corrected: I said in my last post that I had ridden my last dirt/gravel road on this continent. Wrong again: as Alfred noticed by looking at my GPS track, I took a “small” detour (about 20 miles) down a dirt road yesterday to camp at an estancia. Not all camping excursions pan out as planned, and in this case I’ll admit that last night wasn’t great. It was still better than a lot of other places I could have been, but I don’t think I’d spend all that time riding down a dirt and gravel road on a bad chain to stay there again. 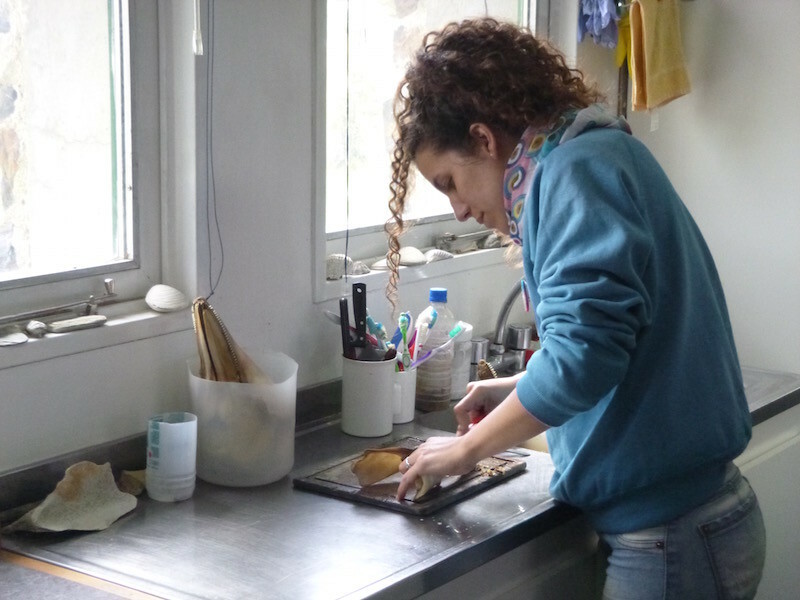 The place had a decent gas stove to cook dinner on (no utensils, pots, pans, etc, but good gas) and hot showers. Okay, that’s it for the good. The bad: the place runs on a generator, from 9pm to midnight. The generator is in the building with the stove and bathrooms. It’s loud. The owner wouldn’t turn it off early, and it turns out that’s because he had company and they were practicing. Yep, the band is louder than the generator. But I was tired and managed to fall asleep anyway. So when I woke up this morning and started breaking down camp is when I realized that the owner’s four dogs had peed on three corners of my tent, and my gas can. Ugh. Heading back to Ruta 3 this morning from the estancia. Twenty miles each way. Now I think I’m done with the dirt and gravel roads in South America. I think. 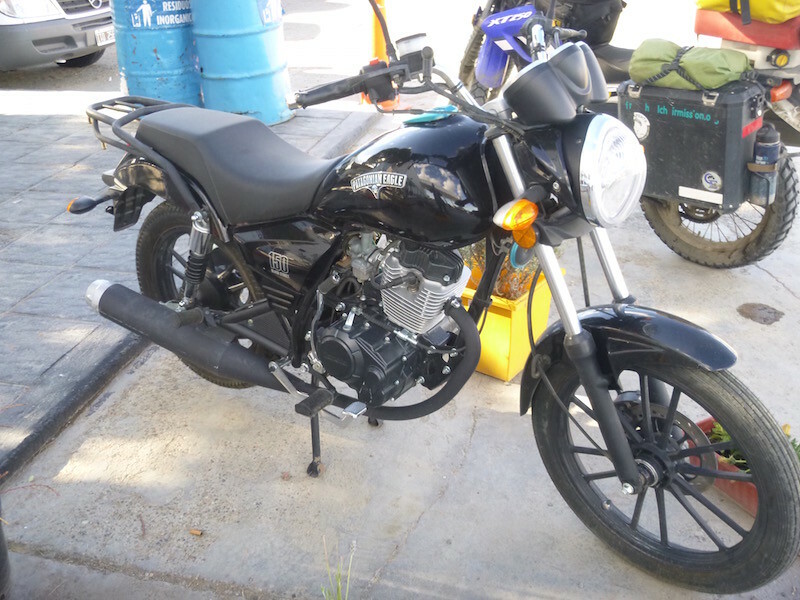 I saw this “Patagonian Eagle 150” at a gas station. Does that make it a Turkey Buzzard? 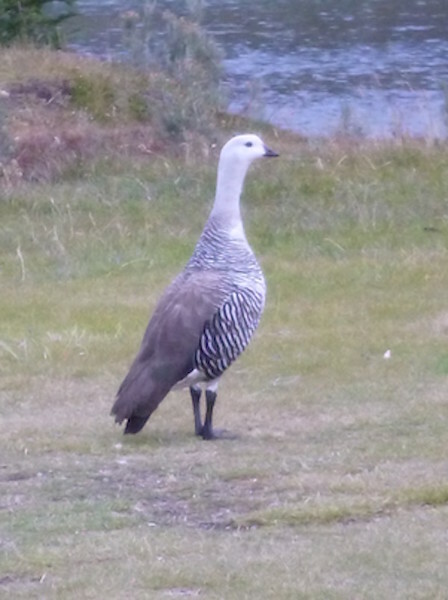 I saw lots of those in Patagonia. I’ve been praising my little 428 O-ring chain the entire trip, but it’s just a chain, and it is a small size, so in the last week it finally gave up. I’ve been adjusting it each day but even then it really needed it twice a day. 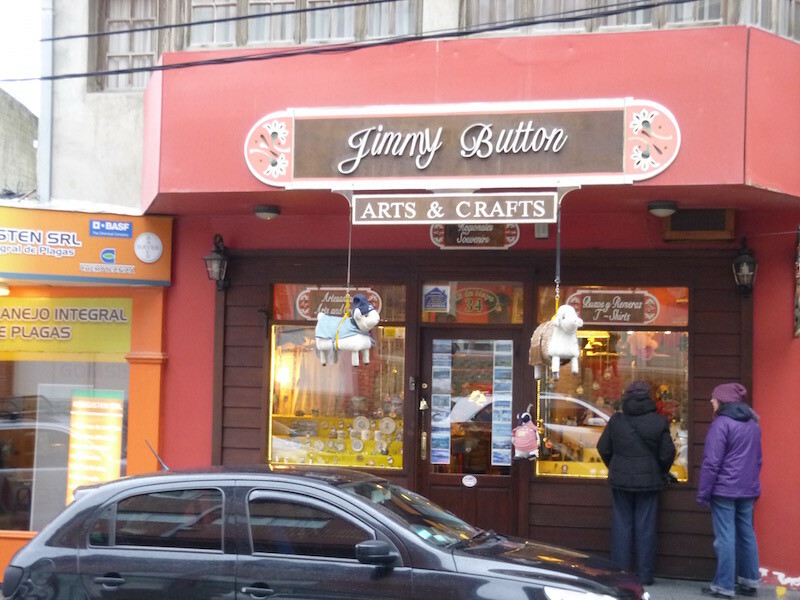 I will have a new O-ring chain and sprockets in Buenos Aires, but I need to get there first. So today I bought a cheap non-O-ring chain and put it on my old sprockets (yeah, I know, it won’t be new for long like that). It just has to go another 1,200 miles. Hopefully. 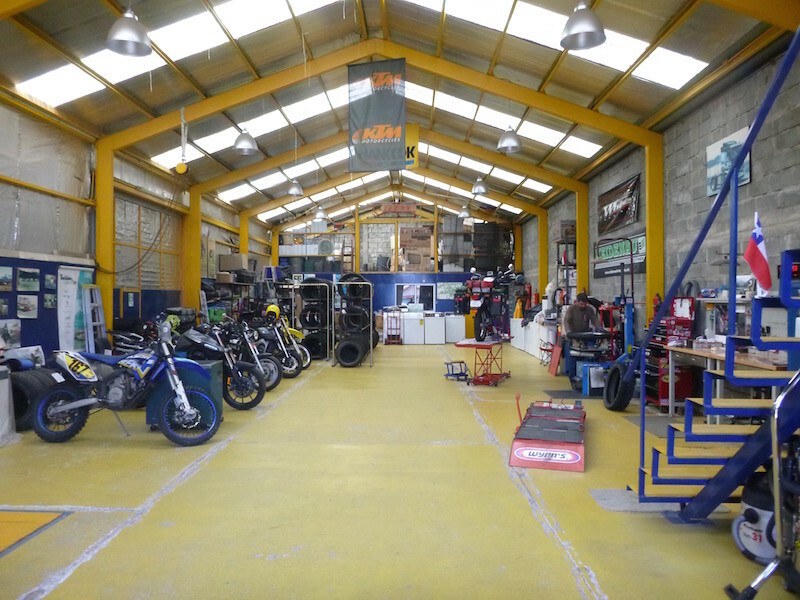 Jonathon at the Yamaha dealer in Rivadavia installed my new chain for me. The original chain is an endless (no master link), so I let him cut it off and put the new cheapo chain on. He and Enrique were great to deal with. Really nice people. Total parts and labor: $34. I’ll put a new OE chain and sprockets on in another couple of weeks in Buenos Aires. After seven months of heading south, I am finally heading north again. 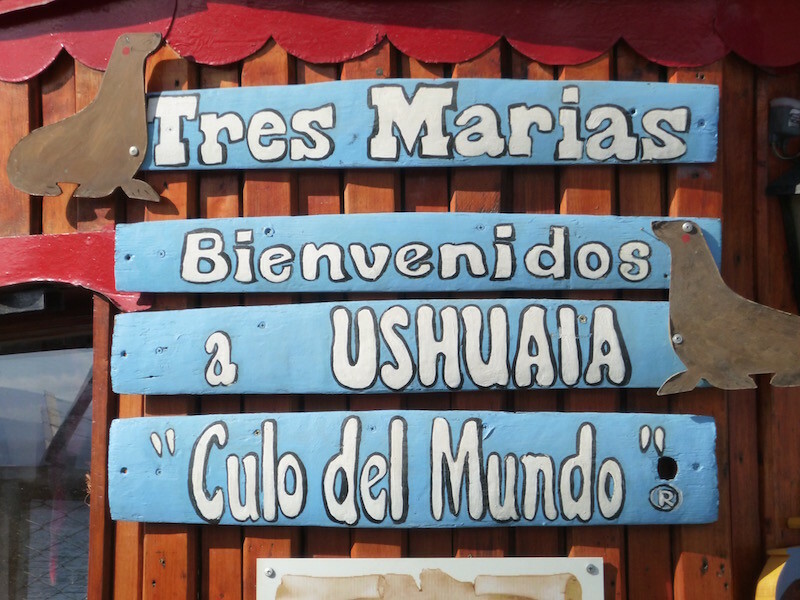 The weather was beautiful as I left Ushuaia; a bit cool — in the upper 30s Fahrenheit — but sunny and almost no wind. View from my hostel on my last morning in Ushuaia. If you zoom in, and look past the airport runway, between there and the big mountains in the background, lies Isla Martinez. There you go, Zeke. Some of the locals obviously have a sense of humor about their location. As I crossed over Paso Garibaldi, the weather changed on the other side. The rest of the day was complete cloud cover, with occasional drizzle, and it seemed to be getting colder. After just a few hours of riding, I turned off Ruta 3 about 15km north of Rio Grande, and drove down a dirt road and out to the beach. There were some small sand dunes here and I set up camp. 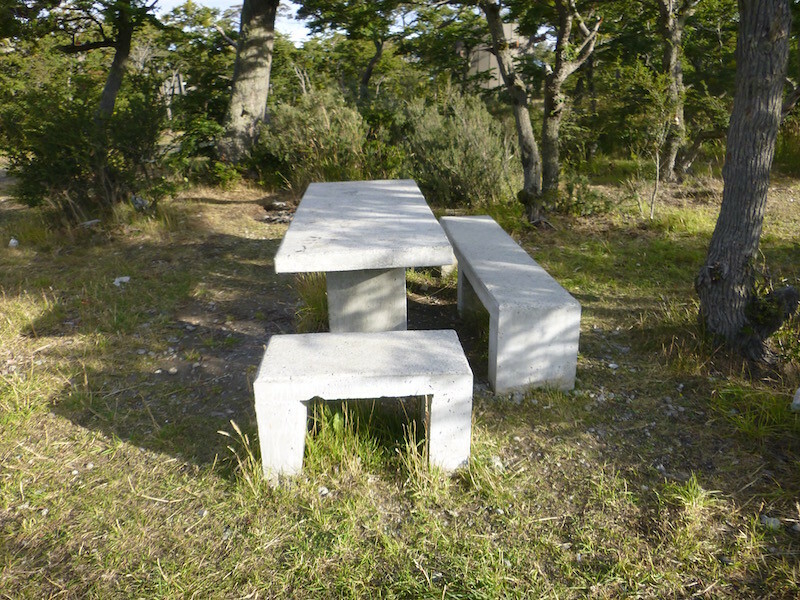 The best kind of camping….free. And not a bad location either. 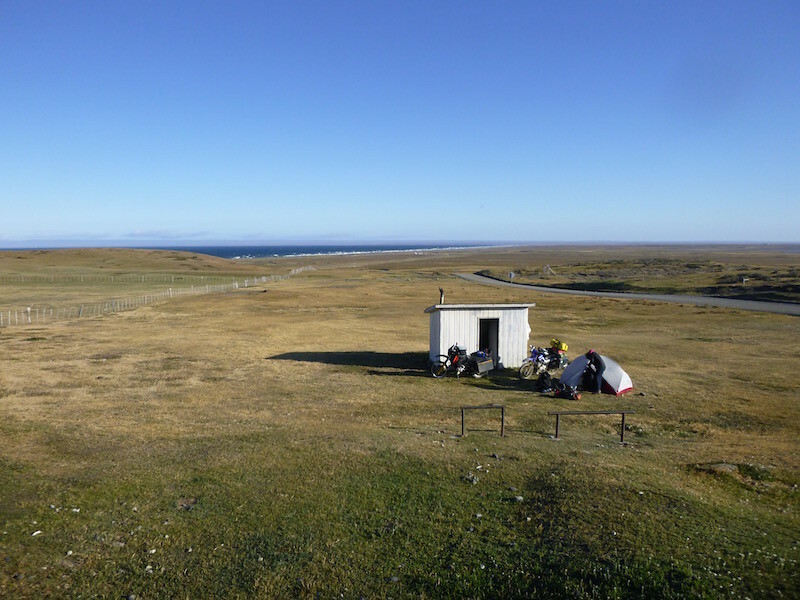 Daniel and Joey were delayed leaving Punta Arenas, and they were headed this way, so we agreed to meet at this spot for the night. They pulled in a few hours later, and as usual, Joey fixed us all a great dinner. The wind picked up overnight, and the rain started. By morning it was still raining, but the wind was slowing down a bit. We enjoyed a leisurely morning and a late breakfast, and by a little after noon the rain let up and we packed up and went our separate ways. Camping made better by dinner and breakfast with great people. While I tend to be a bit more minimalist with my gear, I have to admit I’m a bit jealous at times when Daniel and Joey pull out this extra tarp for rain protection and set up the kitchen for a great meal. 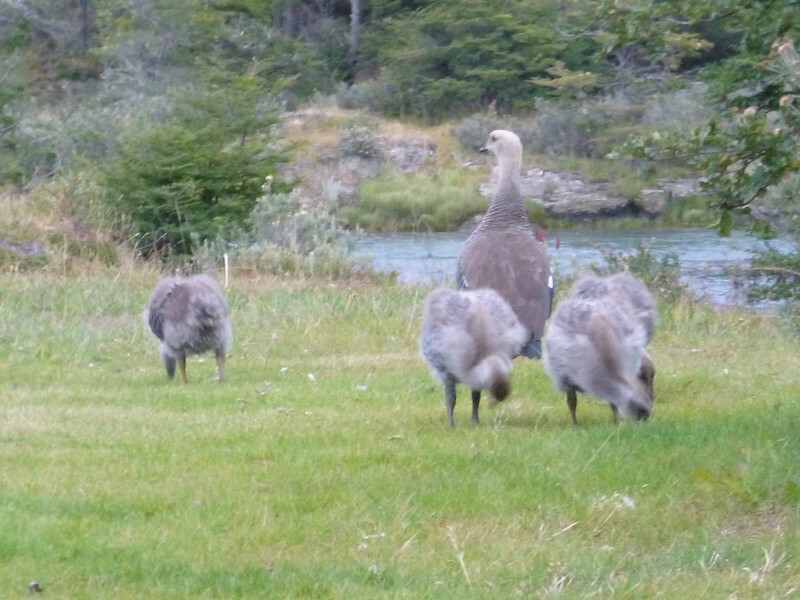 They’re headed south to Ushuaia, then north. I’m hoping to meet up with them again in Buenos Aires. I was getting a late start, but still planned to do a bit over two hundred miles, including two border crossings and a ferry crossing. 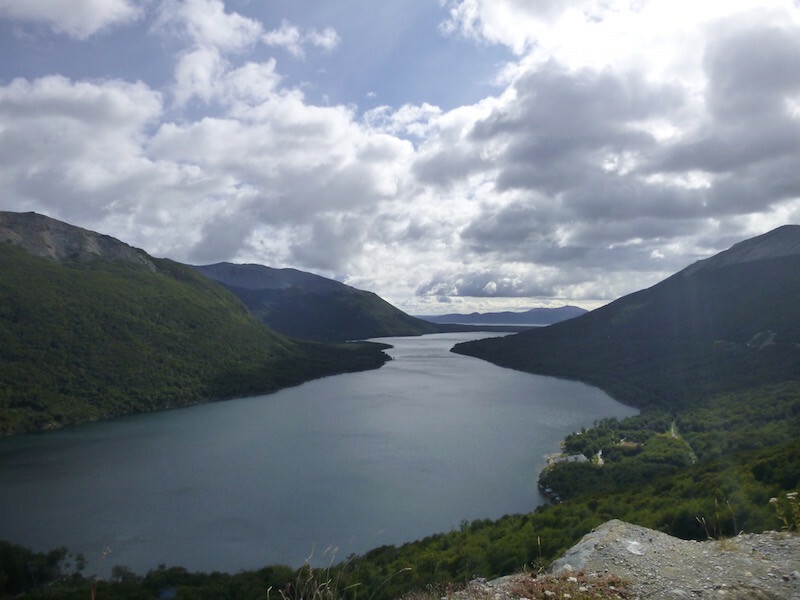 In order to get from this part of Tierra del Fuego, which is in Argentina, to mainland Argentina, you have to cross through Chile. 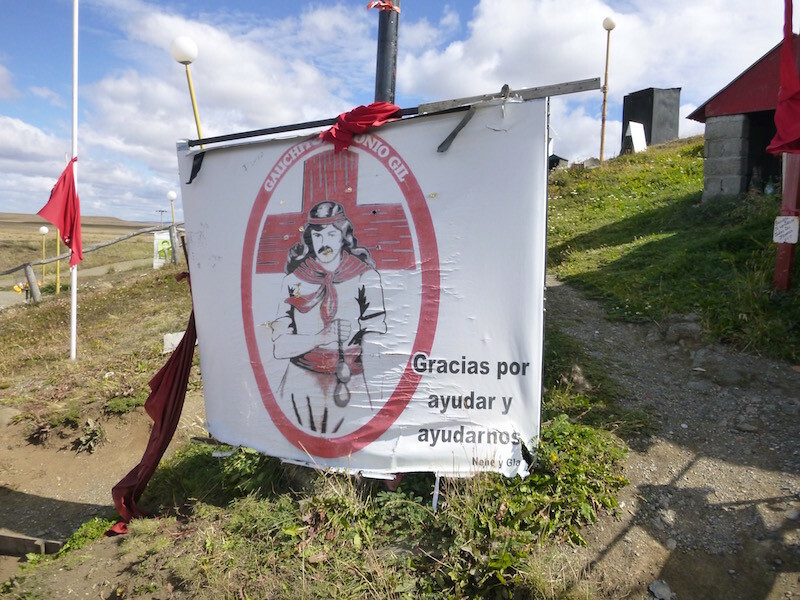 So I crossed back into Chile at San Sebastian, which is also the end of the pavement for 34 miles. After that, a beautiful new concrete road is being built, but only a portion of it is open, so there was another eight to ten miles of gravel road before the pavement took hold permanently and took me to the Punta Delgada ferry crossing and then back into Argentina for the final time. A series of “lasts”: after finishing the last unpaved road, the last ferry crossing for this continent. Last border crossing for this continent (on the bike, at least). I rode into Rio Gallegos just after dark. Unfortunately, the campground where I had planned to stay isn’t really a “campground” in the usual way that those of us from the States think of them. 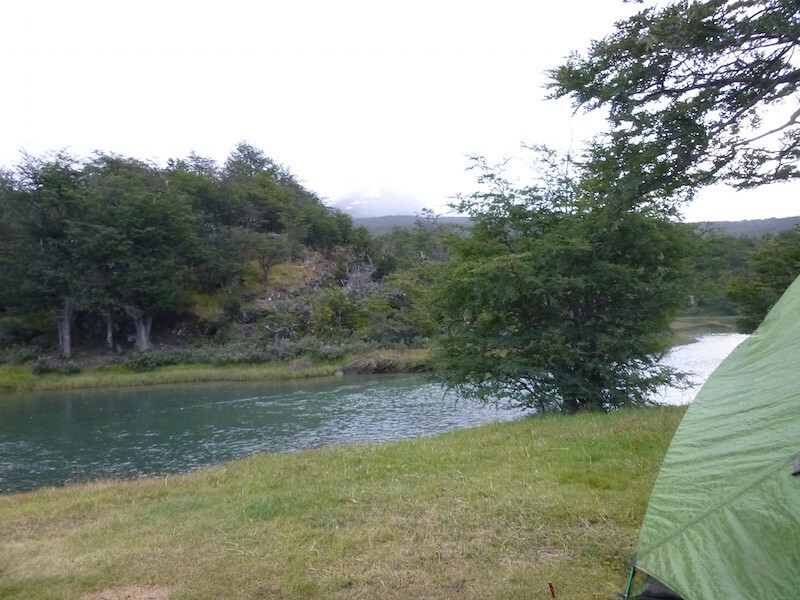 In Argentina, many campgrounds — especially the municipal campgrounds — are places where local families can go to relax, BBQ, enjoy their weekend with the family, and maybe even sleep in a tent. 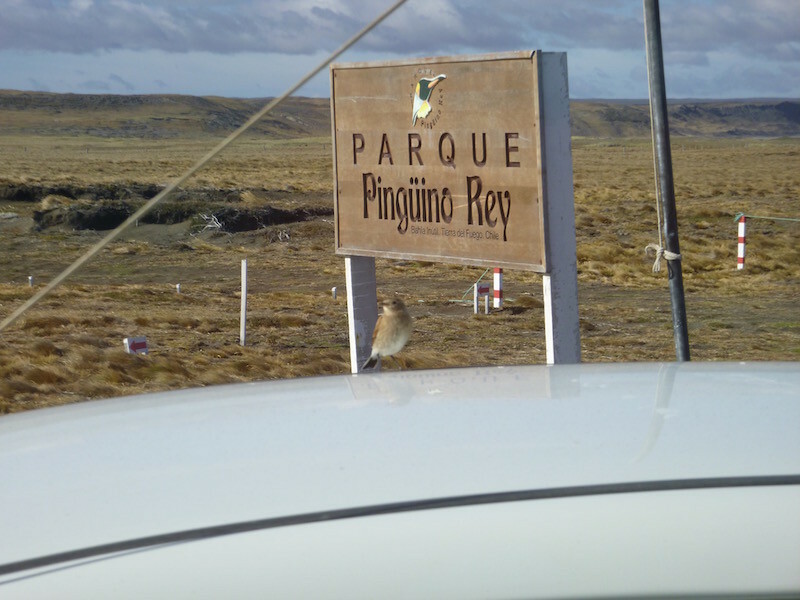 The campground in Rio Gallegos fits all of those things. Except no vehicles of any kind are allowed in the campground. Since everyone shows up in the family car, rather than a camper, trailer, or motorcycle, the car is parked on the street, and then you walk through a small gate into a large walled compound. A side street not visible from the campground wasn’t exactly where I wanted to leave my motorcycle. Since it was nearly 10pm, I decided to find a hotel in town rather than spend more time searching for another place to camp. I’ll make up for it over the next ten nights or so of camping on the way north. 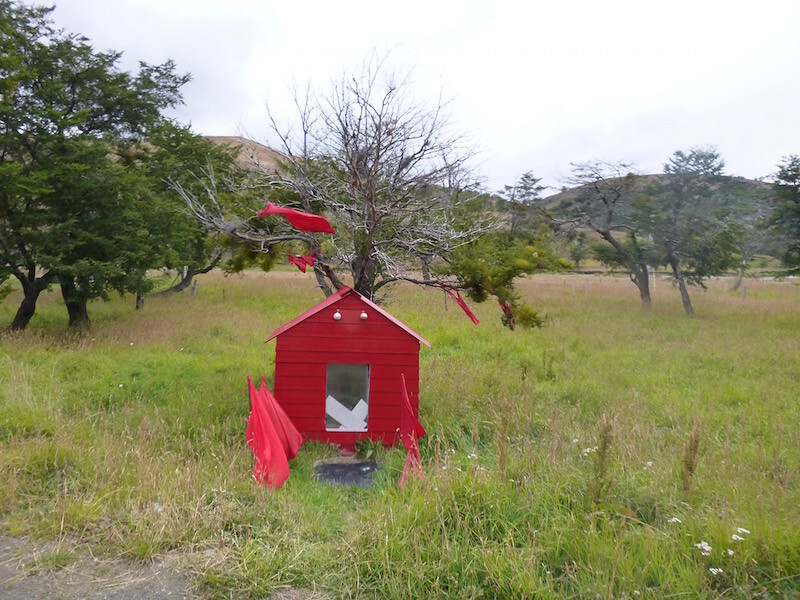 Today I went to Estancia Harberton (Haberton Ranch), about 50 miles east of Ushuaia. This 48,000 acre ranch was founded by Thomas Bridges, a missionary from the UK in the 1880s, and includes four mountains, three rivers and 40 islands. It was named after his wife’s hometown of Harberton, Devon. They raised cattle and sheep on it for generations, until in the mid-1990s a snowstorm that lasted 21 days wiped out most of the livestock. 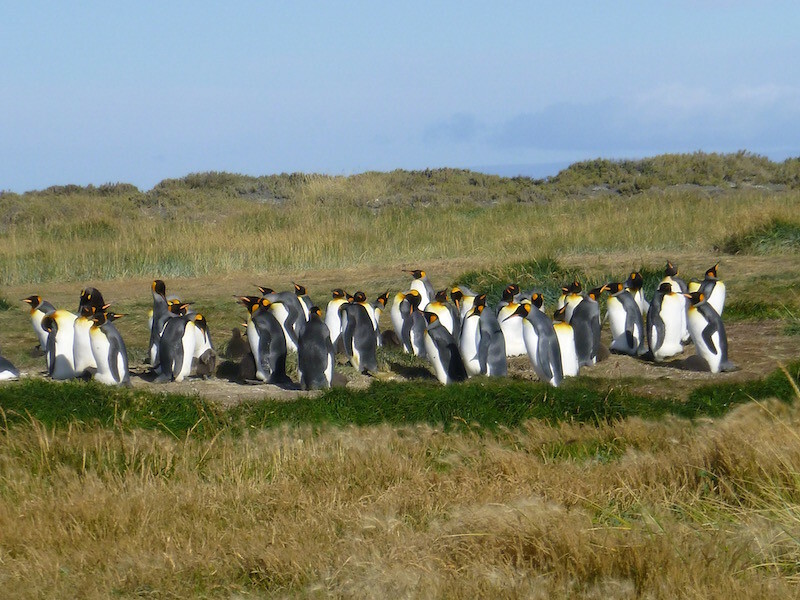 At that point, the fourth generation family owners decided to stop ranching and the sole source of income now is from tourism, including tours to Isla Martillo, a tiny island on the ranch that has a large penguin colony. 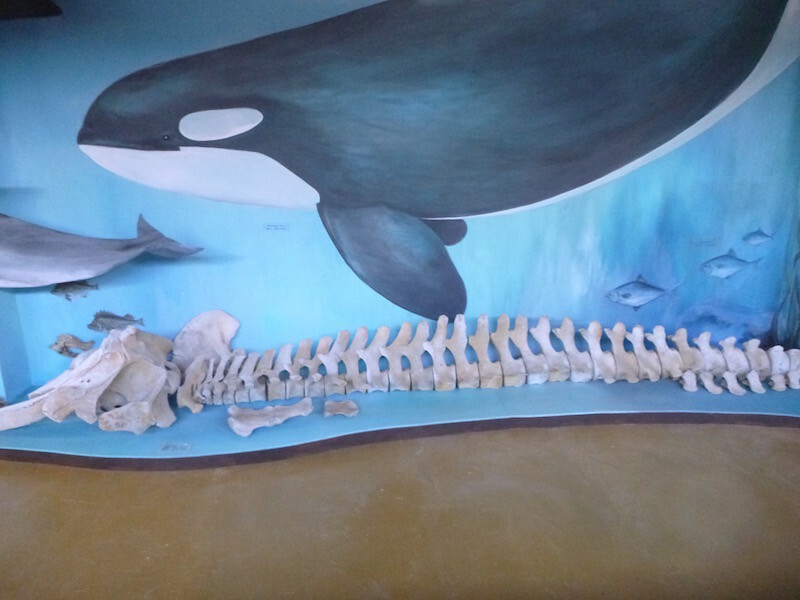 The ranch also has a museum which has a large collection of marine mammal skeletons, including various dolphins, seals, sea lions, and whales from the area, and some penguins and other birds. 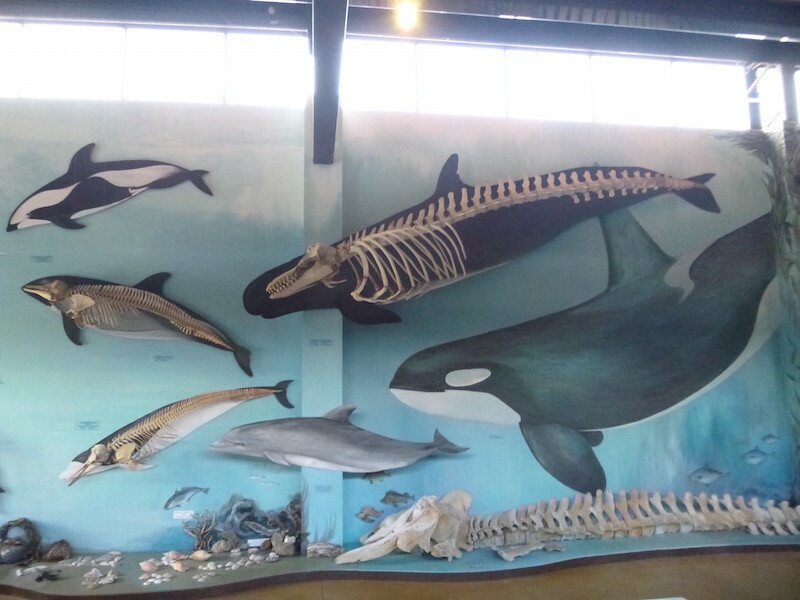 Many of the skeletons are mounted on the wall over a corresponding painting of the animal. 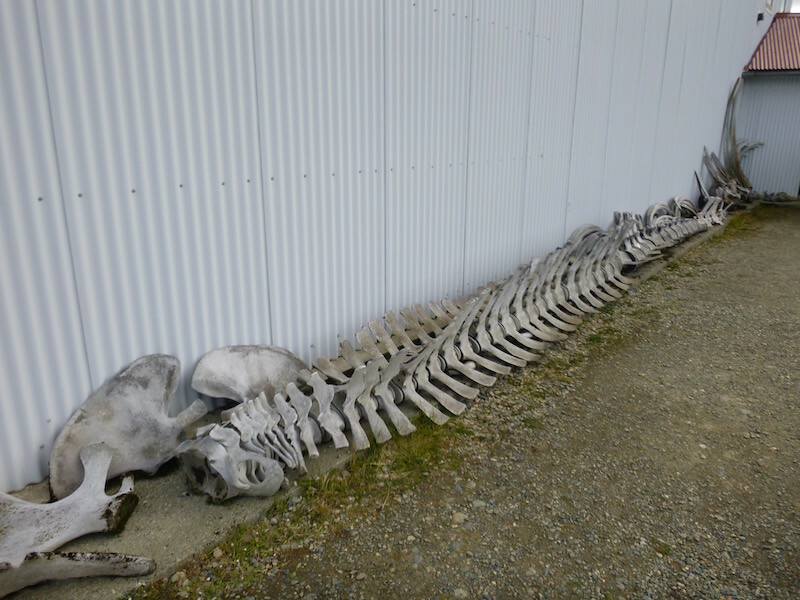 Whale skeletons, too large for inside. Marine biology students serve one month internships here. This one is cleaning the skull of a specimen. But the big attraction is Isla Martillo. 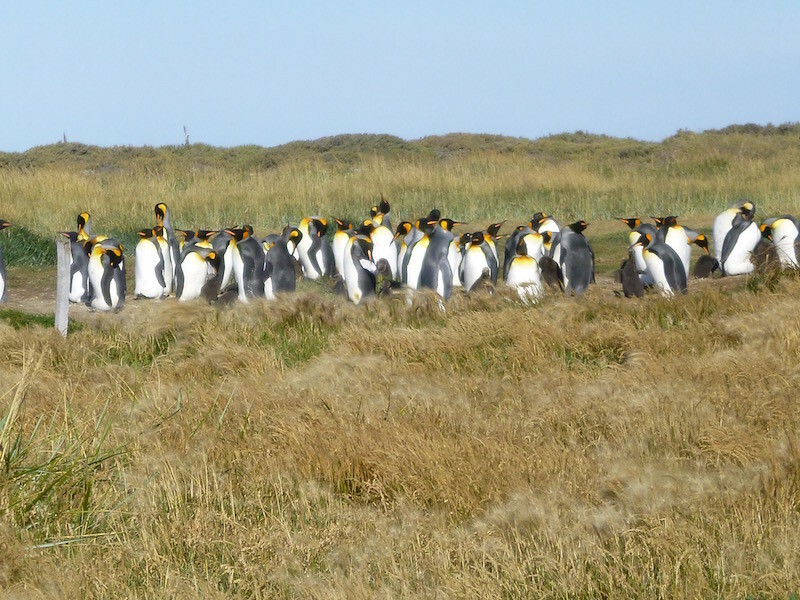 It’s a ten minute boat ride from Estancia Harberton, and they only allow 80 people a day to actually walk with the penguins on the island. They do two morning tours with 20 people each, and two afternoon tours with 20 people each. 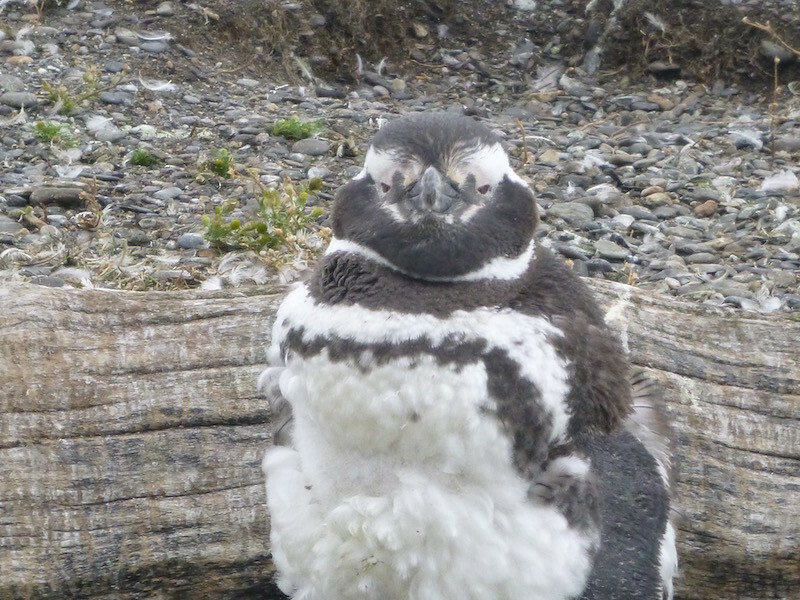 Many of the younger penguins were molting, changing to their adult feathers. 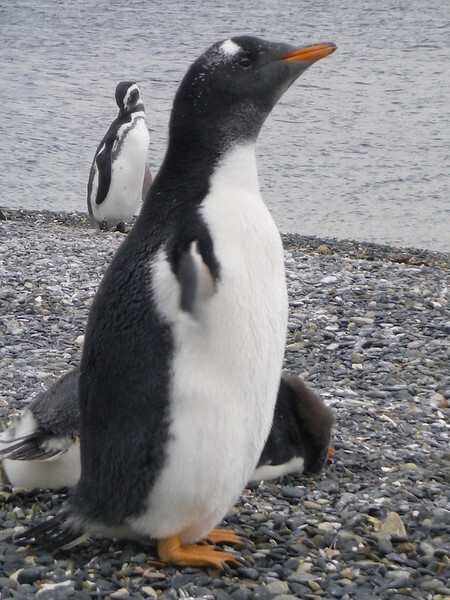 Gentoo penguin. 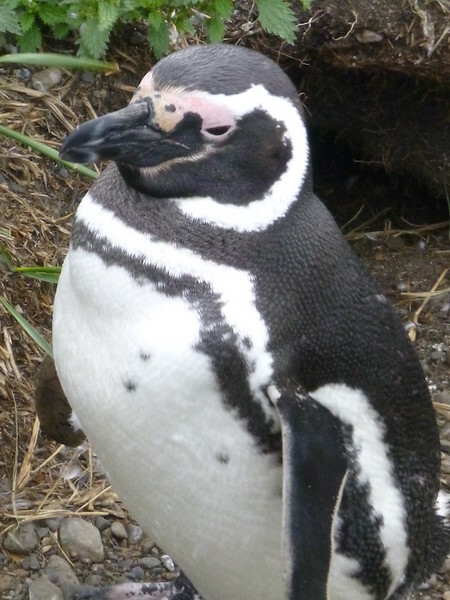 Note the different markings from the Magellanic penguins. Similar size. 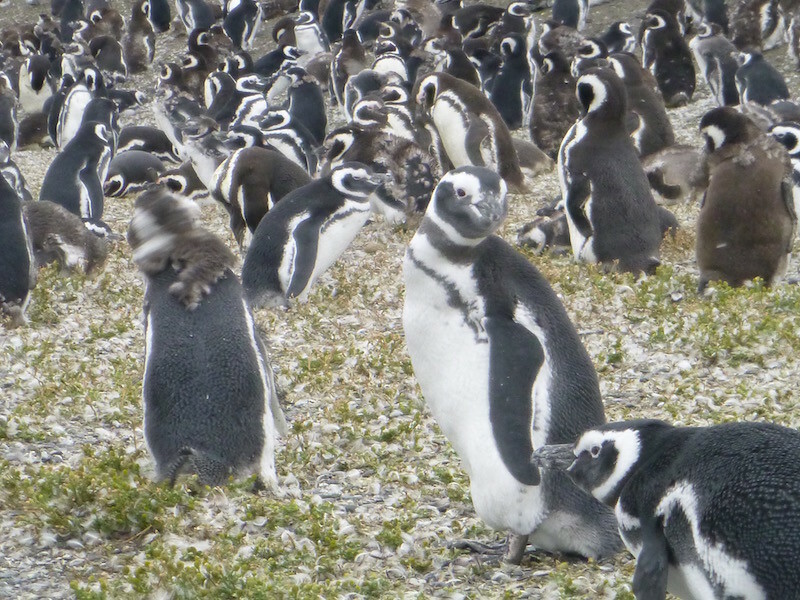 While the Magellanic penguins go north for the winter, the Gentoo stay here year round. 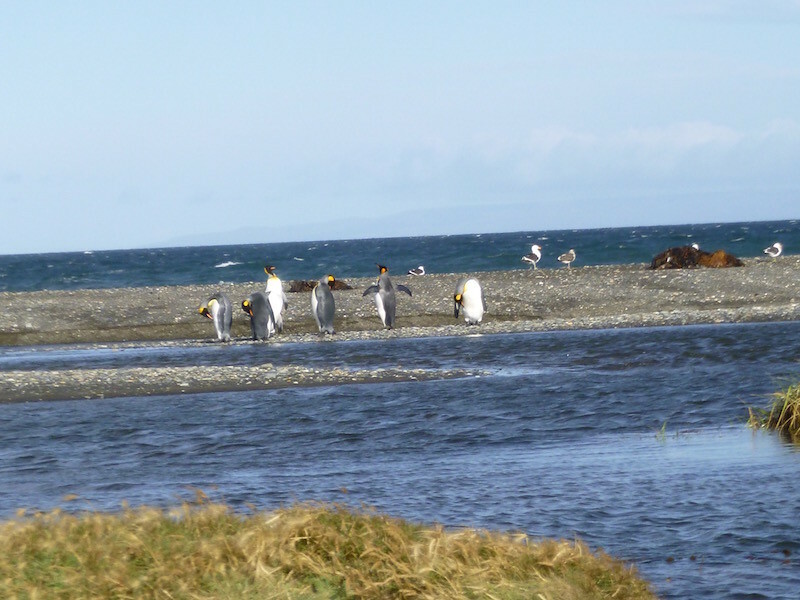 The lone pair of King Penguins on the island. 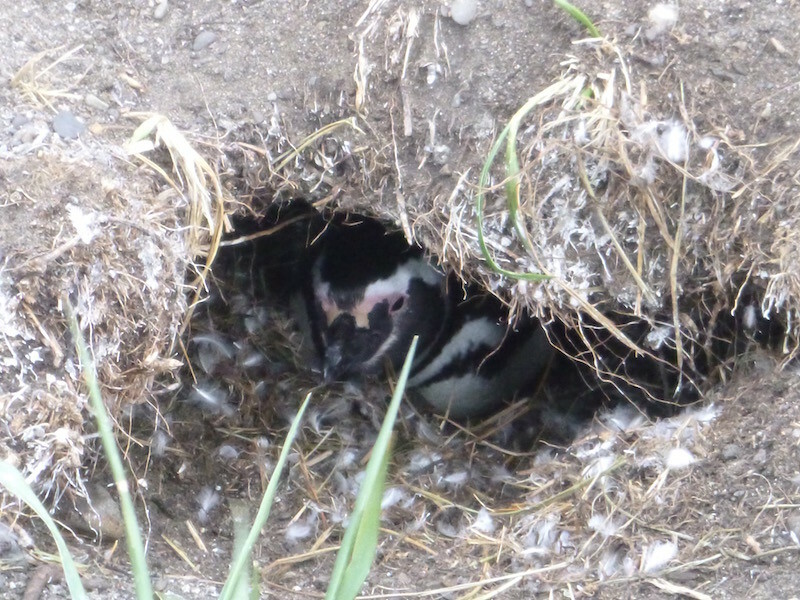 There are 7,000 nesting holes on the island. 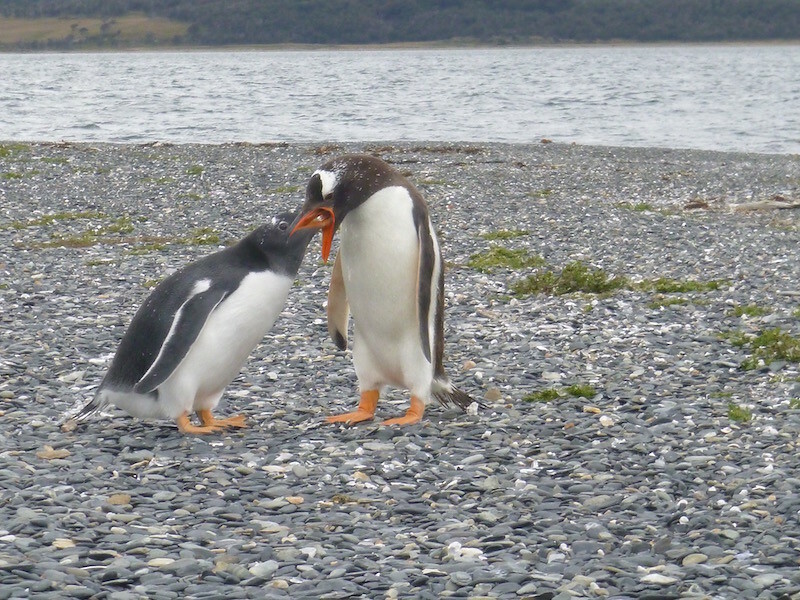 I caught a short video of this “beak slapping” ritual between two penguins, likely mates. If you listen, in the background you’ll hear what sounds like a donkey braying. 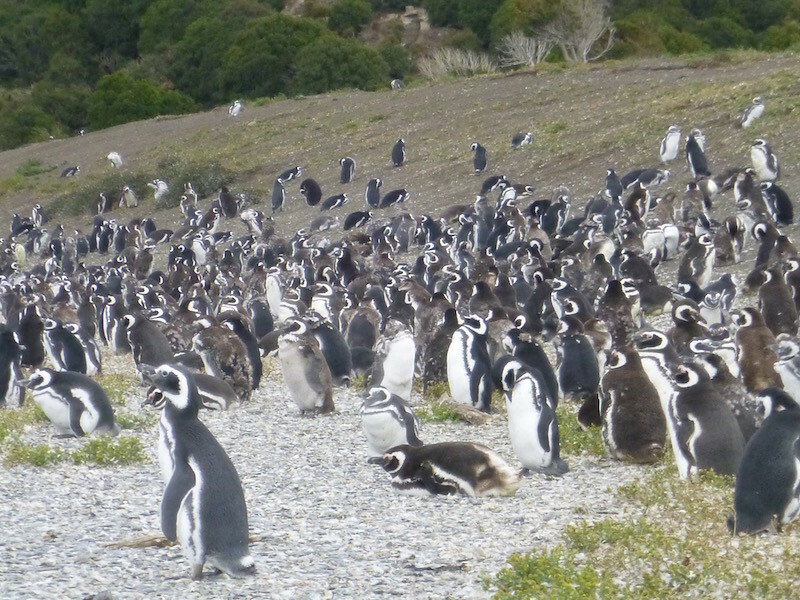 That’s the sound Magellanic penguins make. They raise their beaks straight up, puff out their chests, and make this braying sound. 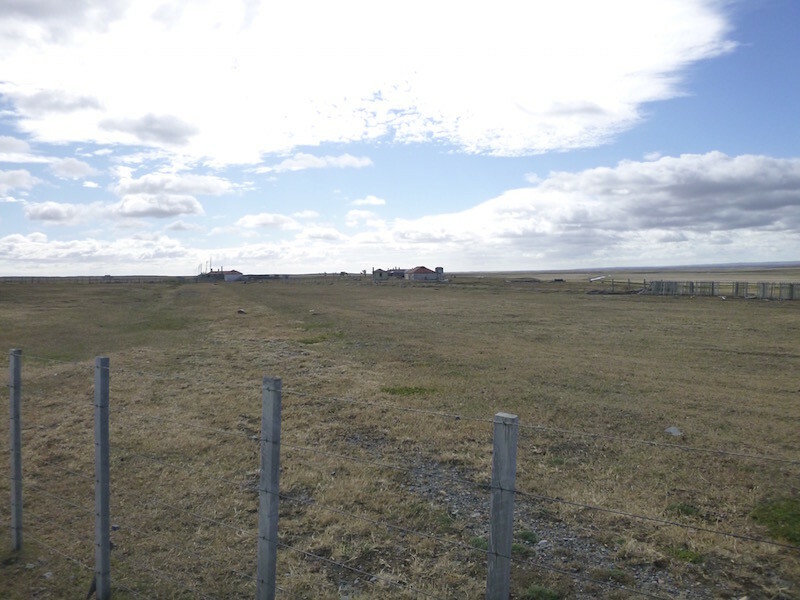 From the ranch you can see across to Puerto Williams. I really wanted to go there, if for nothing else because of the name. But it’s a difficult and costly proposition, and the truth is, there’s nothing there. It’s a town of about 5,000 people with little infrastructure. The passenger ferry from Ushuaia (without the bike) is $300 round trip, and it’s only a 30 minute boat ride, plus a 30 mile bus ride each way. 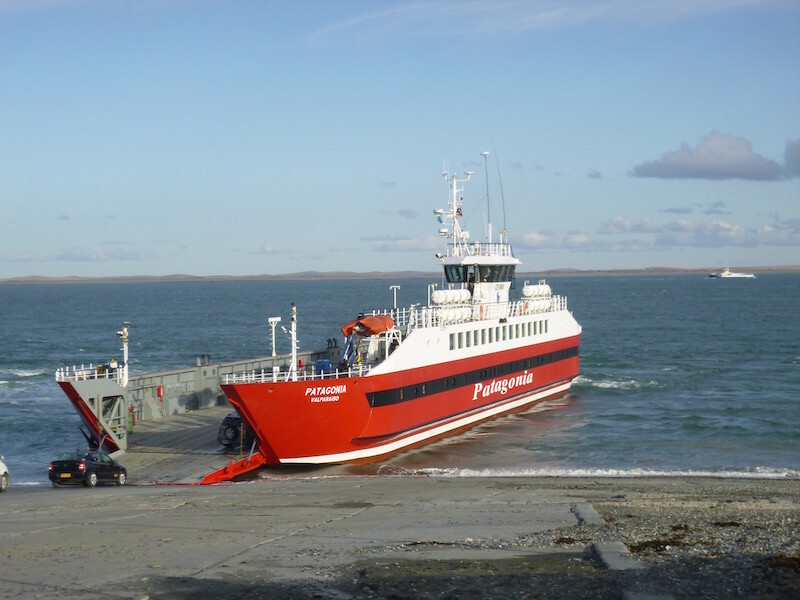 The car ferry is from Punta Arenas, and only leaves on Wednesdays, returning on Saturdays, and is a 34 hour trip and much more costly. And with both, there’s no guarantee on the sailing either direction due to the wind conditions here. These are called Bandera, or Flag Trees. 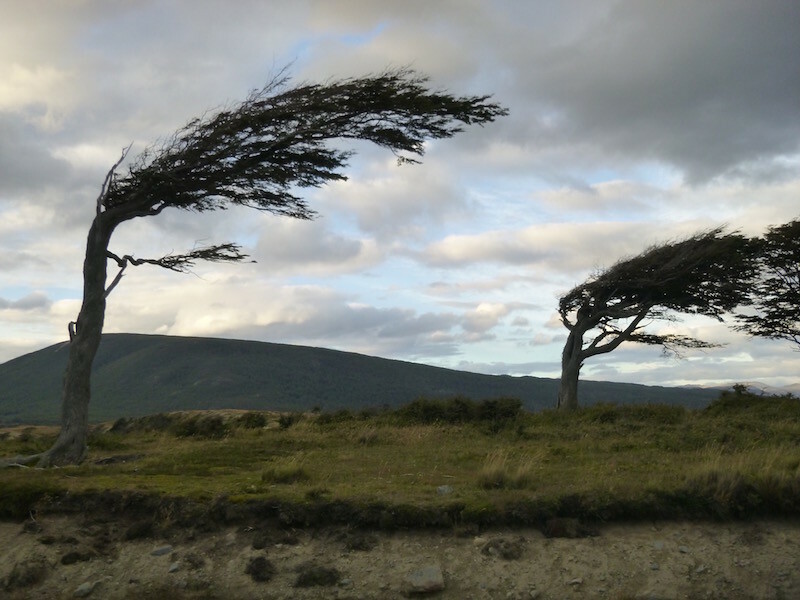 Did I mention the wind blows here? A lot. The last few days have been planned (term applied loosely) around the wind. I left Tolhuin late in the morning after waiting for the wind to die down. Which it did, as soon as the rains came. The rain didn’t last long, but gave me a chance to pack up and hit the road with less chance of getting blown off it. 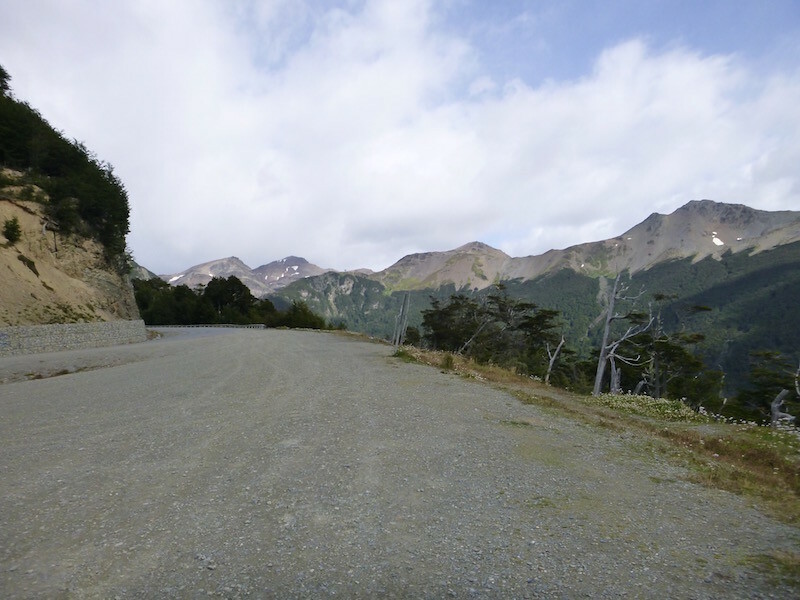 The last mountain pass before heading down to Ushuaia…Paso Garibaldi. Looking back at Lago Fagnano from Paso Garibaldi. 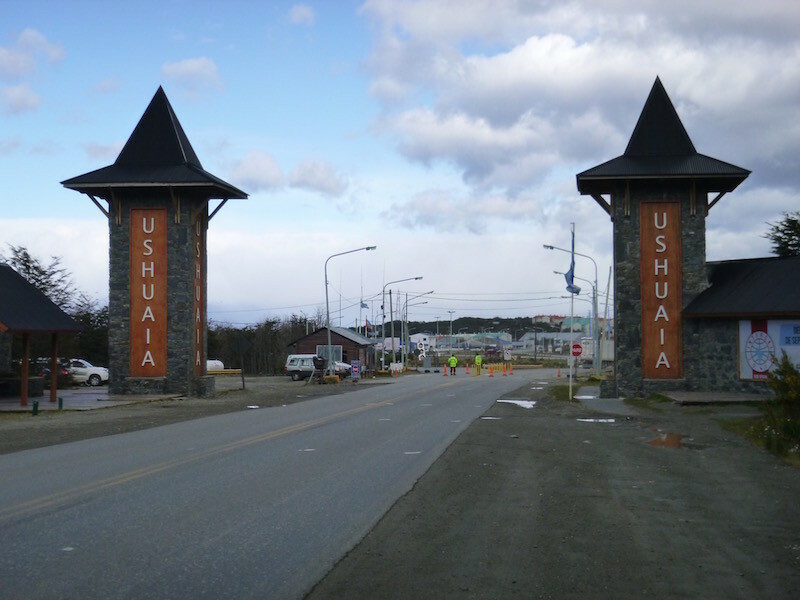 Entry to Ushuaia. Last town south in Argentina, and claimed as the southernmost city in the world. 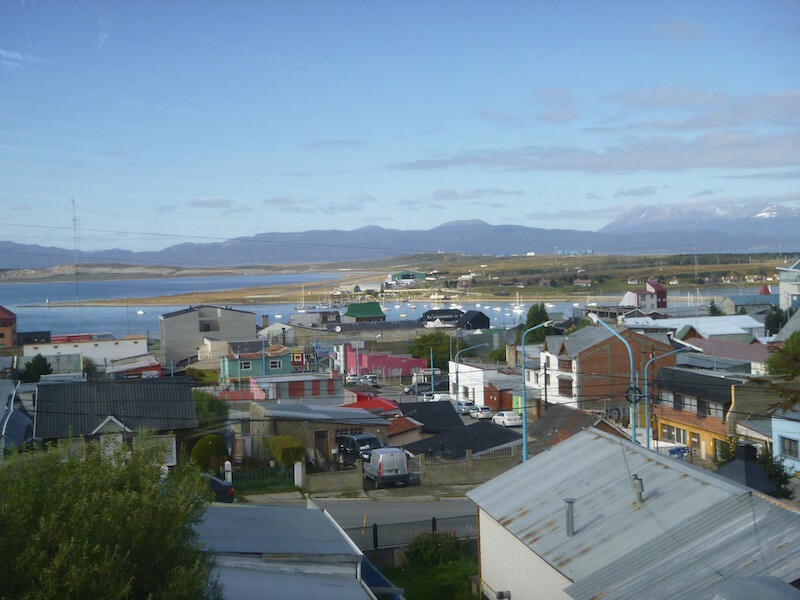 Ushuaia is built on the side of the mountain, as the mountains go down to the bay. Thus the streets tend to look a bit like San Francisco in one direction, and then relatively flat and level perpendicular to the shoreline. The cruise ships here bring lots of tourism. And lots of tourists. If not for tourism, this would definitely be a much smaller, and much slower town. As it is, there are tour buses and taxis everywhere, and they all seem to be in a tremendous hurry, which can get interesting when you’re trying to get rolling up one of these hills again after the tourists step out in front of you mid-way up. 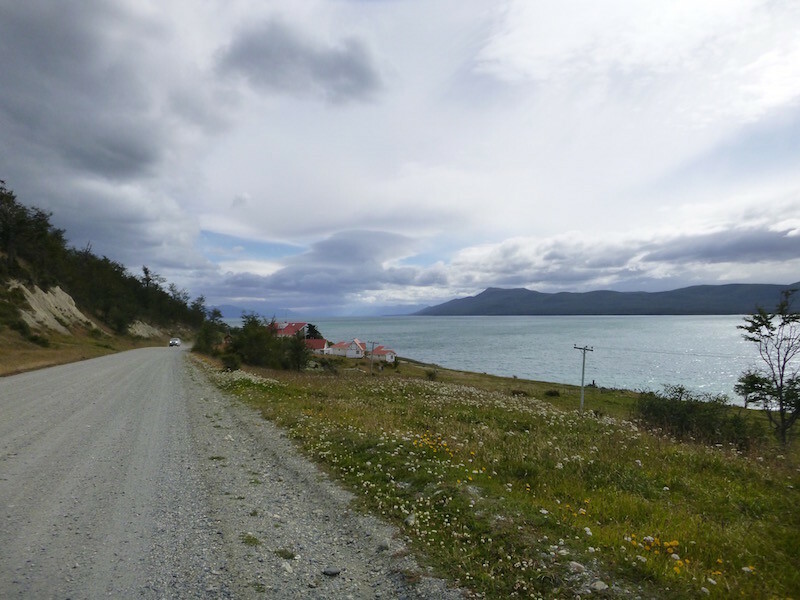 There is also a steady stream of tour buses and taxis heading out to the Tierra del Fuego National Park, just west of town at the end of Ruta 3. This is a gravel road, and they don’t seem to care if the dust reduces visibility to near zero, they are still going to drive right on your taillight in the gravel (and mud). They seem to be in a hurry to take as many tourists as possible to the end of Ruta 3 at Bahia Lapataia. And oddly, I had to actually get in line to take a photo of my bike with the famous sign at the end of the road, even in the rain. I lost count of how many people came up and wanted their photo taken with me in front of the sign. Crazy. As I was leaving the parking lot where the sign is at the end of Ruta 3, I happened to notice the Alaska license plates on this VW bus. 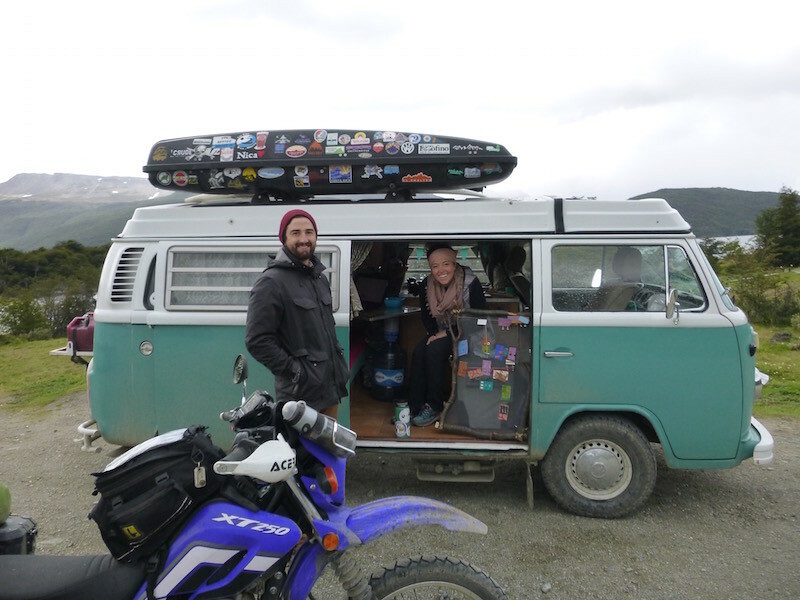 Dillon and Tessa spent the past year driving their 1975 VW Westfalia from Alaska, surfing, skiing, hiking, and enjoying themselves along the way. They plan to ship it from Buenos Aires to Florida and start a new journey there. 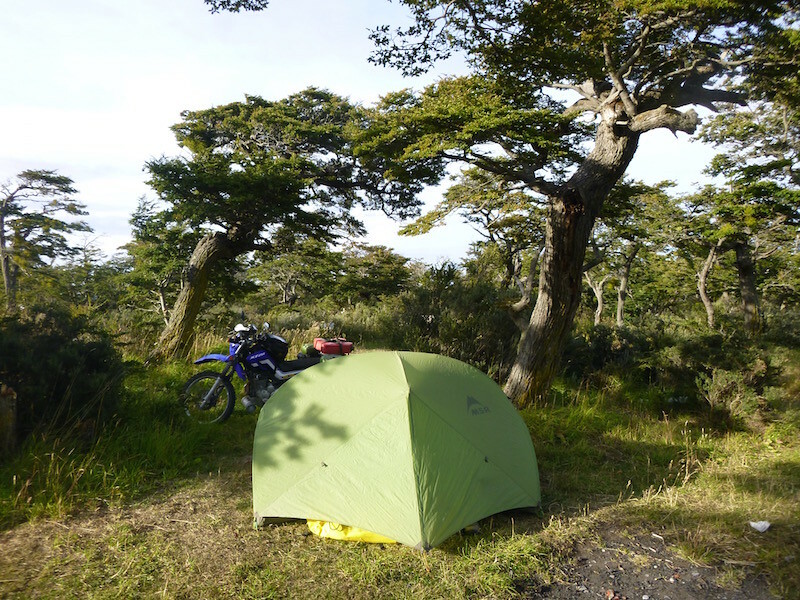 The hostels in town were mostly booked — at least the ones I could find a place to park the bike in — so I decided to camp at the National Park. I had already paid my $12 park entrance fee to take the photo with the sign, so after that, camping was free for up to three days. Might as well take advantage of it. And after all, the park is beautiful, with lots of trees, rivers, trails, and wildlife. 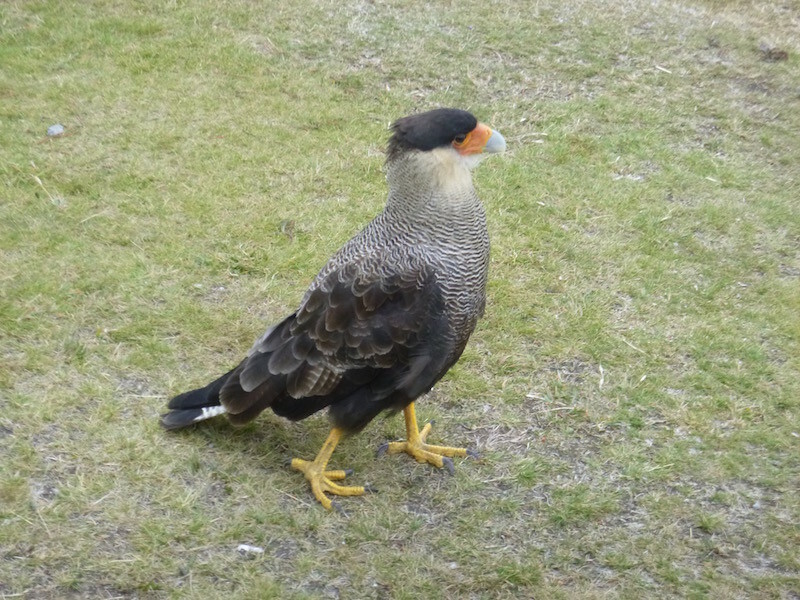 Three of these guys swooped in and hung out with me at my campsite. Obviously expecting to be fed. Again, I know nothing about birds, but this guy appeared to be the Dad, and stood around not far from me while Mom and the chicks fed. I loved his black boots. Mom watching over the family as they dine. This was about ten feet from my tent. These are very young but not small birds. It rained a little in the evening, but the wind wasn’t bad. Until about 6am. That’s when it really started howling. I sat in the tent until 11am, wondering if the poles would snap before the fabric disintegrated. I was afraid to try to take the tent down, because all of my stuff was in it, and one wrong move would mean things would get blown into the river. Amazingly, the tent held up perfectly. Another piece of equipment that I will certainly buy again. By noon I was ready to head into town and try again to find a hostel so I could put my stuff in a locked room, park the bike somewhere relatively safe, and walk to town. 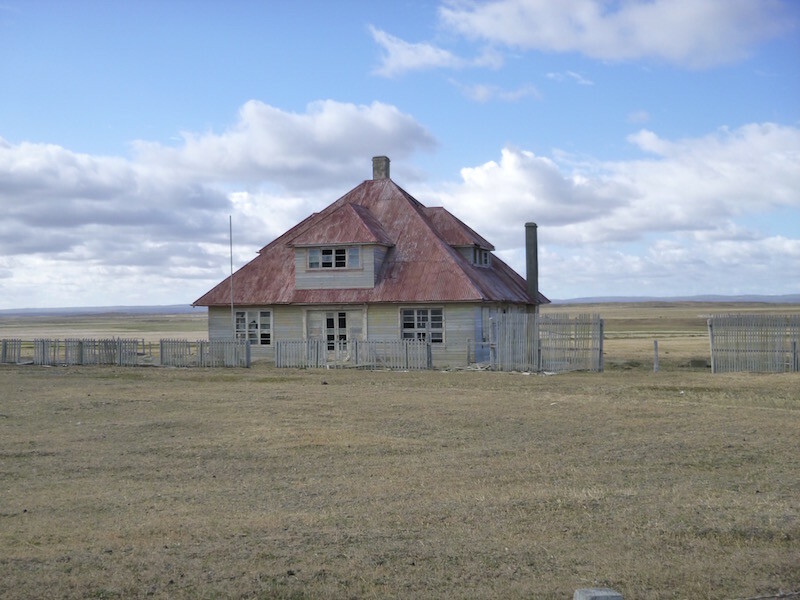 I found what I was looking for at Hostel Aonikenk, and after a trip to two ATMs I had enough money for a few nights here along with a tour or two. City sign designating the “end of the world” at the bay. 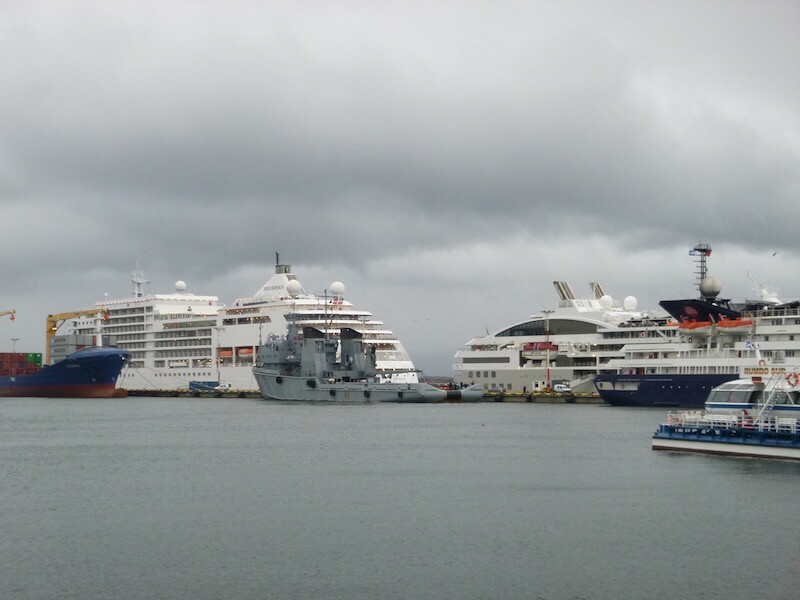 The cruise ships were in port. Good for businesses, bad if you’re looking for a place to park, a place to eat, or a place to stay. 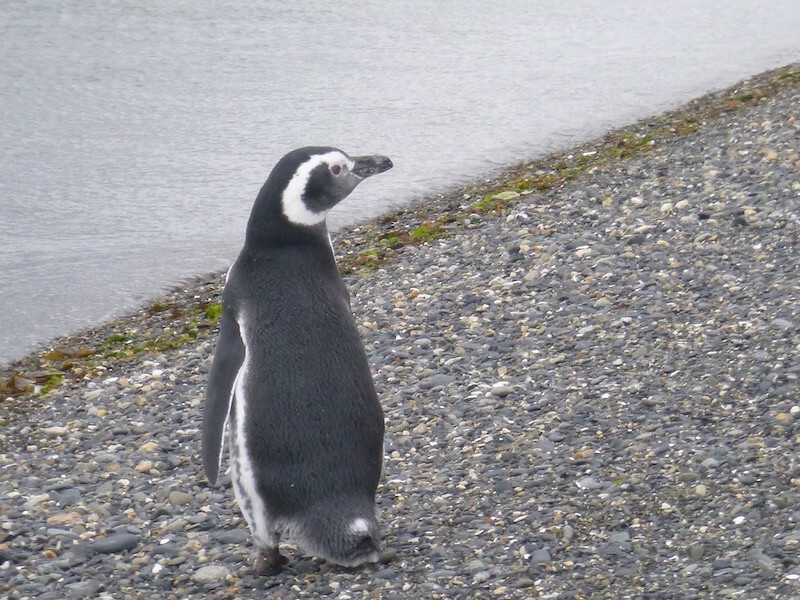 I left Punta Arenas on the 1pm ferry to Porvenir and Tierra del Fuego. While waiting on the ferry, the weather constantly danced between light drizzle and sunshine. The wind was ever-present of course, but not terrible, at probably 20 to 25 mph. Mauricio and Mama at Casa La Escondida. 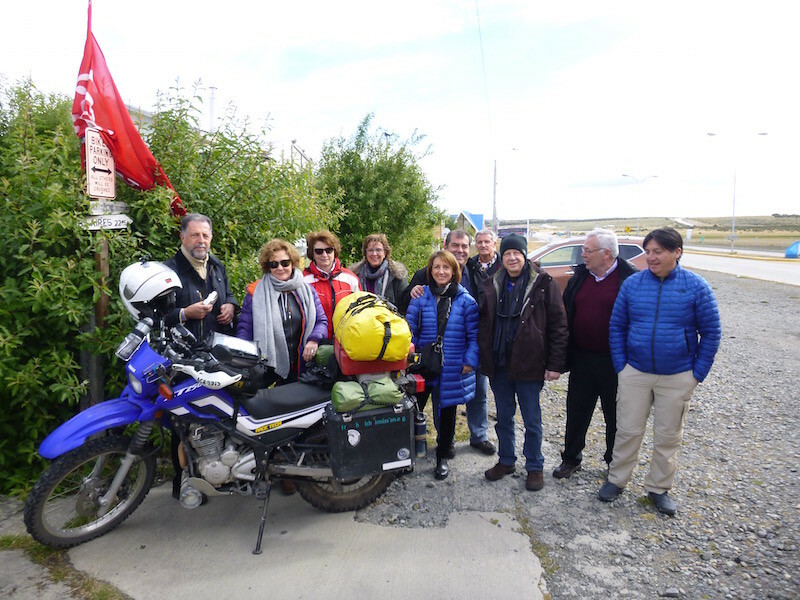 This was a superb place to stay just slightly outside of Punta Arenas, and a big part of the reason was the hospitality, although the accommodation and food was excellent as well. 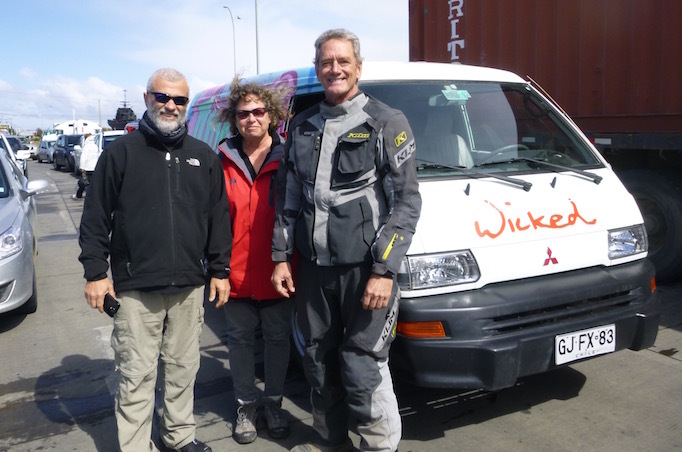 While waiting in line at the ferry dock, I met this couple from israel traveling Patagonia in a rented Wicked camper van (same type van as the Austrian couple I met earlier). 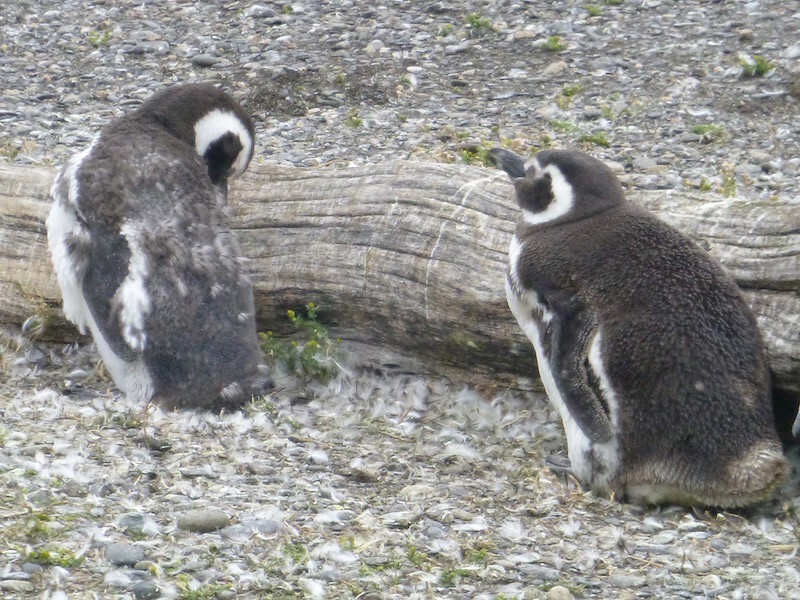 They’re just getting started on their camping journey, and I’m pretty sure I’ll see them again in Ushuaia. The ferry ride is about two hours. As soon as I rode off the ferry and into Porvenir it began raining, sleeting, and the winds suddenly increased to about 50 mph. I set off out of town only to find that the pavement immediately stopped. It was mostly gravel, but in a few places there was no gravel, and it turned to slick, snotty mud. I slipped and slid and managed not to crash somehow but my tires balled up with mud so bad that the bike wouldn’t steer at all. Eventually the rain let up, the wind increased even more, and the mud came off my tires in the gravel and rock road. I stopped at a place on the side of the road with some big trees thinking it would offer some wind break, but the trees were too far apart. As I stood there, I dropped one of my gloves. The wind caught it and it took off faster than I could run with my bad ankle. After about a hundred yards I managed to catch it just before it blew under the fence and out to sea. 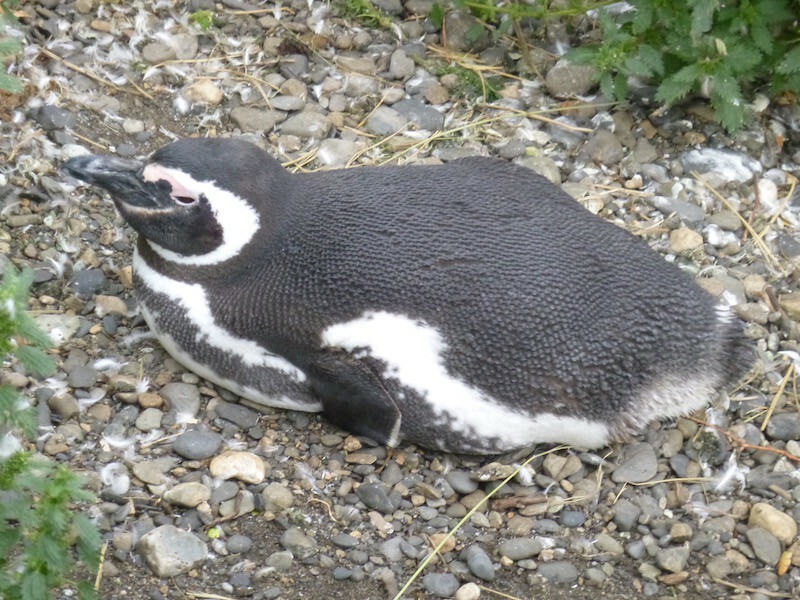 My physical therapy for the day complete, I remounted and continued toward the Penguin Park. 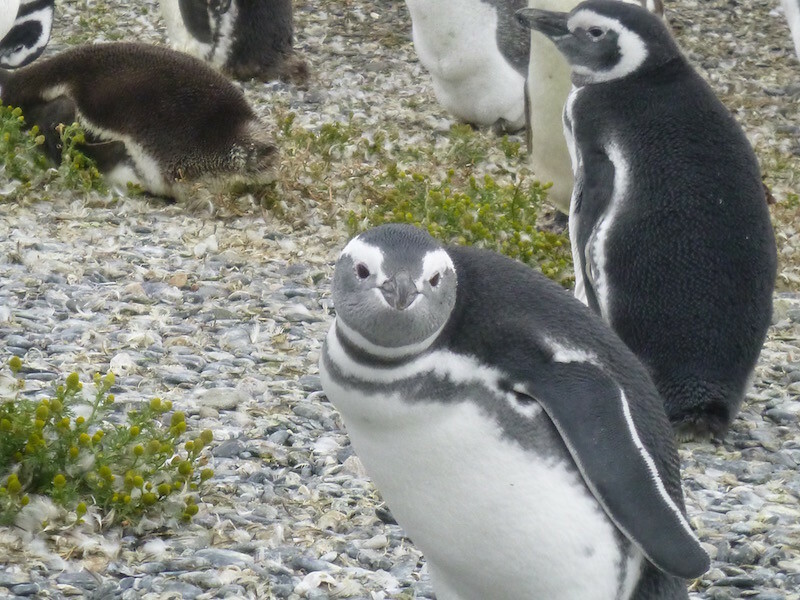 My GPS coordinates were for a place I found on iOverlander that just said “grassy spot” and was about a mile past the penguin park. I was hoping there would be a hill or dune or something to hide behind with my tent. When I got to the penguin park there was a guy on a loaded motorcycle there so I pulled up next to him, noticing the German license plate. 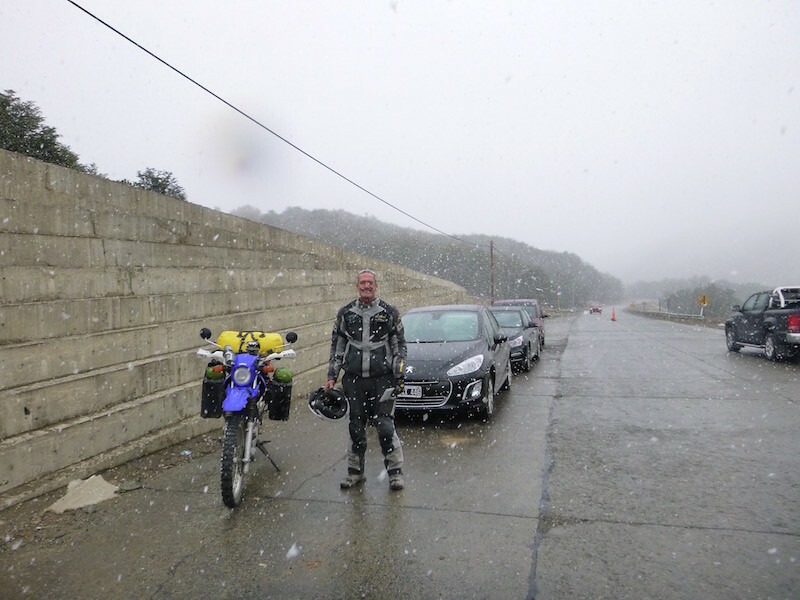 Ernest was on a beautiful late ’80s BMW R100GS, and had just finished the tour of the penguins. He said the park ranger told him he could sleep in a small “house” up the road and I was welcome to join him. 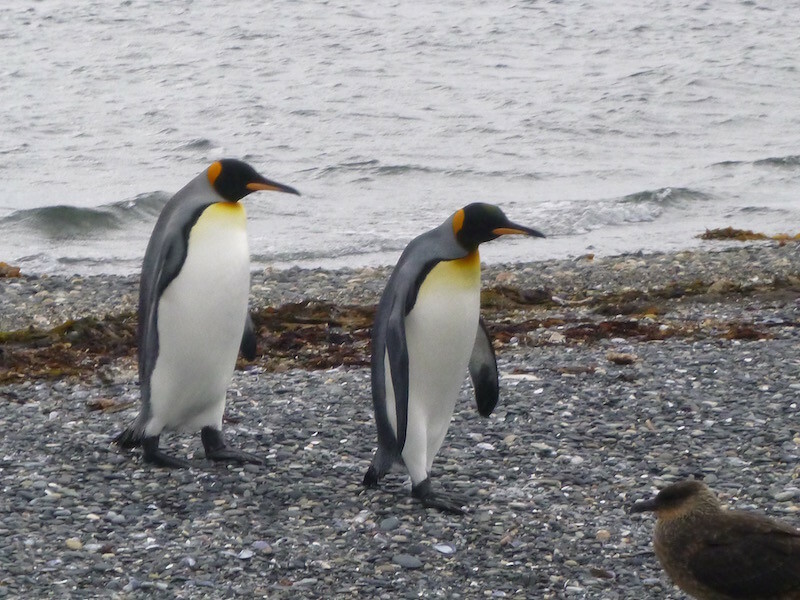 The park was closing soon, and I had planned to visit the King penguins in the morning, so I followed Ernest up the road. When we got there, it was a tiny building about 7 feet wide by 10 feet long in the middle of the grassy field I was planning to camp in. Inside the building was a metal bunk bed frame (no mattresses), a table, and a stove made out of a cut-down 55 gallon drum. 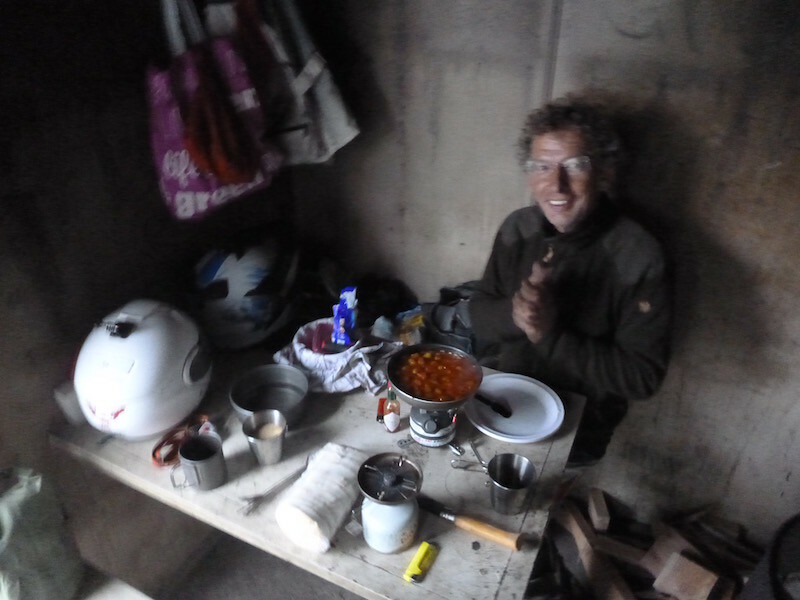 We started a fire in the stove, put the air mattresses and sleeping bags on the bunks, and Ernest cooked dinner. It was actually pretty comfortable. Just before dark another couple showed up: a German brother and sister hitchhiking/backpacking to Ushuaia from Punta Arenas. They set up their tent on the less windy side of the building and slept there. Nothing for many, many miles to block the wind. Except this great little hut with a stove, table and beds in it. It’s actually for the sheep herders here, but they let others use it when they aren’t. 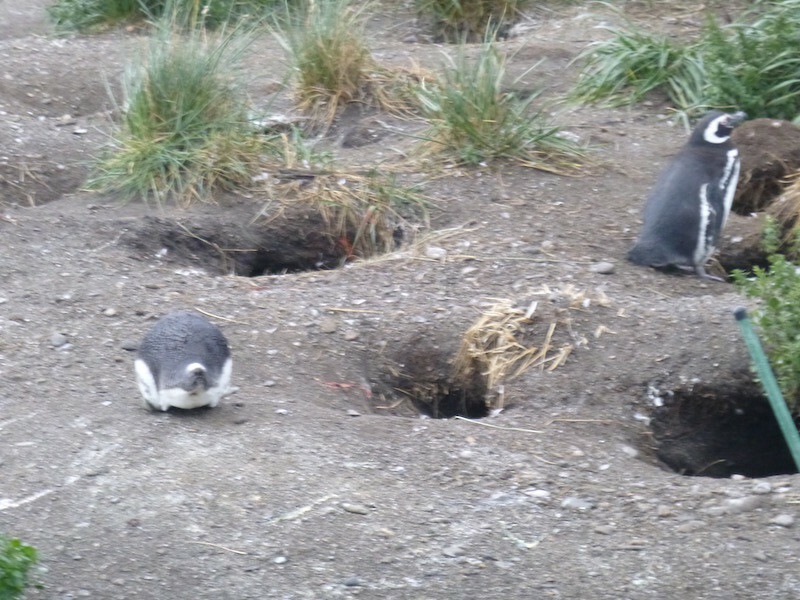 And the employees at the Penguin Park show their appreciation by keeping it clean. If you could see the bikes better, you’d see that Ernest’s BMW is spotless, while mine is covered in mud. He left Porvenir before the rains. Ernest cooking dinner in the nice, warm hut. Cut-down 55 gallon drum wood-burning stove in the bottom right corner of photo. The wind finally dropped to probably 30 mph or so this morning. The King Penguin Park doesn’t officially open until 11am, but when I rode up around 9:30, the ranger was very friendly and invited me in early. 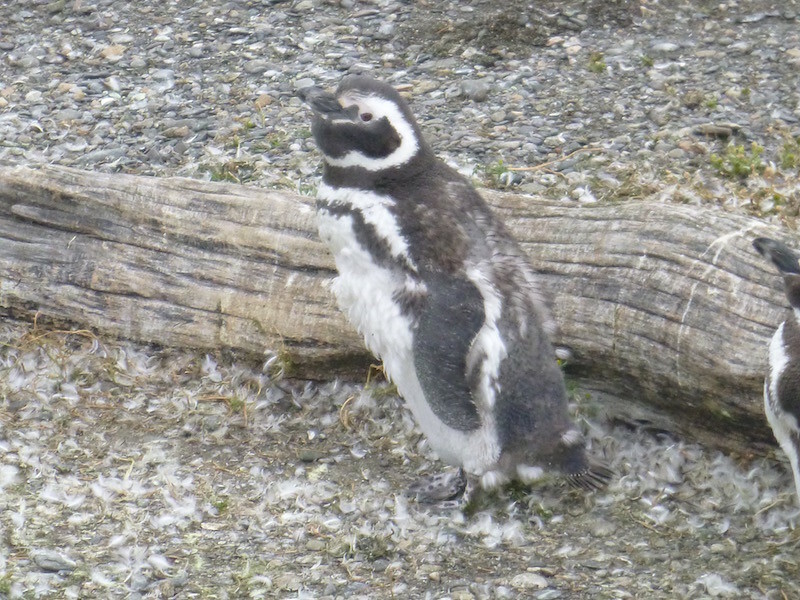 I spent about an hour walking around watching the penguins. The size and color of these guys is amazing. I wished I had binoculars. 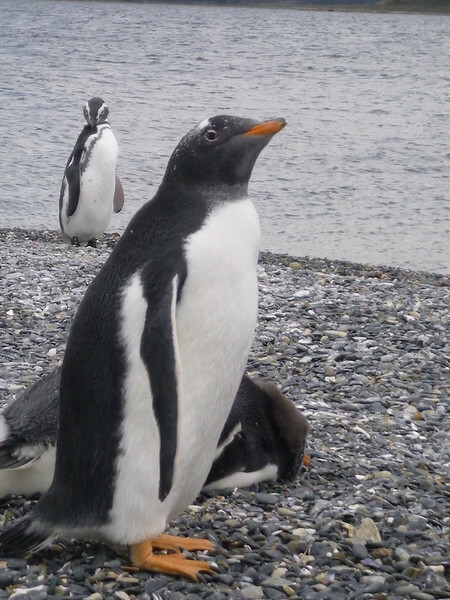 In the photos, if you look closely, you can see several young penguins, who aren’t old enough to have the orange markings yet. 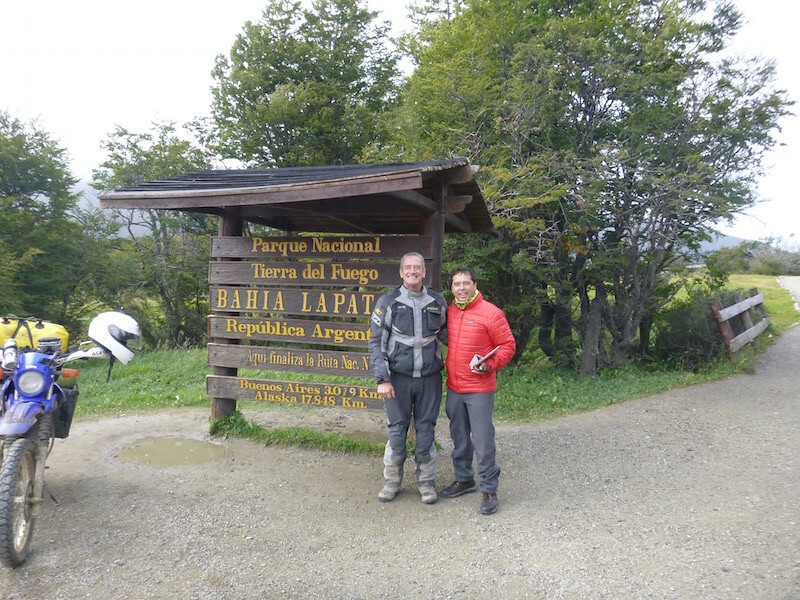 After visiting the penguins it was another 30 miles or so of gravel road to the border crossing into the Argentine side of Tierra del Fuego. The ghost town of Onaisin. This looked like the school or community center. The entire remains of the town were fairly intact but fenced off. 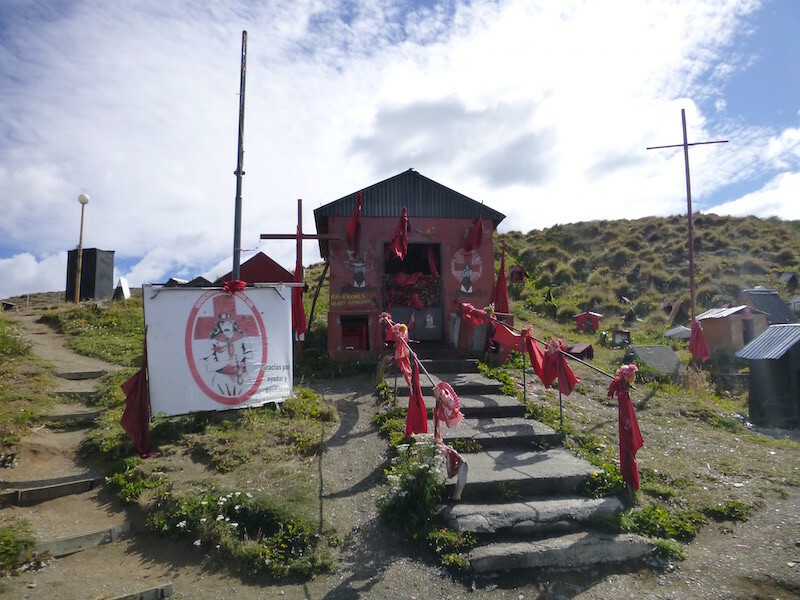 The town was established by English sheep herders in the 1890s, but apparently didn’t last. It sits on the shore of Bahia Inutil (Useless Bay). You see a number of abandoned wrecked cars sitting where they met their demise on the side of the road. This one says “Better Cycling” on the side of it. As I finished up my paperwork and was just leaving the border crossing, Ian rode up. He’s been to Ushuaia and is on his way to Buenos Aires to ship home. It was good to see Ian again. He’s headed to Buenos Aires and home. I hope to see him again in a few months. The pavement begins with Argentina Ruta 3 at the border crossing, and it’s a smooth, beautiful road all the way to my hosteria tonight in Tolhuin. I’m only sixty miles from Ushuaia, but this hotel on the shore of Lago Fagnano was just too nice and relaxing not to stop at for a night. 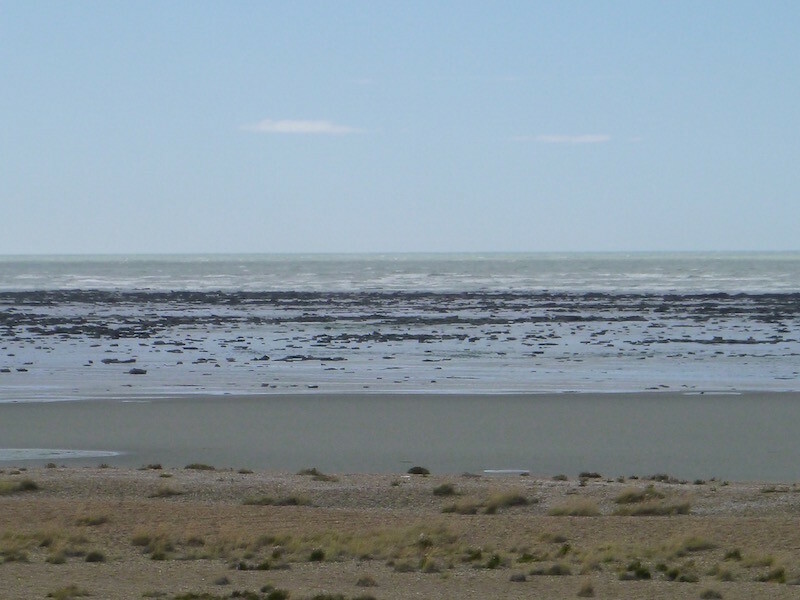 South of Rio Grande on the Atlantic coast: When the tide goes out here, it REALLY goes out. Like about a quarter of a mile. My hotel for the night, overlooking the lake. About a year and a half ago, I rode my Super Tenere from Texas to Canada and back. Along the way, I met up with my friend Tom and we rode together for a while, going our separate ways in Montana and meeting up again on the way back down in Utah. On that trip, I had a GPS failure, and an aftermarket electronic item I had installed on the bike also failed. We joked at the time that the ideal setup would be “paper maps and an air-cooled 650” for simplicity. Little did I realize then that I would be taking an air-cooled 250 on this journey. And while I carry a few paper maps with me, I still rely on my GPS for a lot of my navigation. For those following along that might be considering a similar trip, I thought I’d offer some insights into navigation that I’ve gained over the last several months, as well as some other small things I learned along the way. First, if you are truly hard-core, old-school and savor the journey via paper maps, more power to you. It’s still probably the best and most satisfying way to go. On the other hand, if you’ve come to rely on turn-by-turn GPS instructions, you’re probably going to be frustrated and surprised in Central and South America. Somewhere in between is a good solution, and I’ve come to rely on a combination of technology to get me where I want to go rather than where Garmin thinks I should go. If you use a Garmin GPS device, you may or may not have noticed that there is a lack of maps available for some parts of the world, including down here. Much of that gap has been filled by Open Source Street Maps (OSM). For free. Type a little information into a website, and within a short time, you have a custom file you can download and install on your GPS. This is certainly better than nothing, and works relatively well, but also has a number of failings. For example, it doesn’t even recognize cities the size of El Calafate or El Chalten in the list of cities. It also won’t always route you in the best manner, regardless of whether you have “avoid dirt roads” or “avoid tolls” or whatever switched on or off. Therefore, a little extra work is required. In addition to the OSM maps installed on my Garmin, I use a combination of Google Maps and an app called Maps.me. Google Maps allows me to look at the bigger picture, zoom in or out and determine whether the road is paved or dirt, and gather wayoints along my route to force the GPS to take the route I want. In addition, maps.me has more detail, better off-road routing capabilities, and lists many more campgrounds and other facilities than the Garmin and OSM maps. It’s possible to download the maps from maps.me one country at a time so you don’t need wifi to use them. 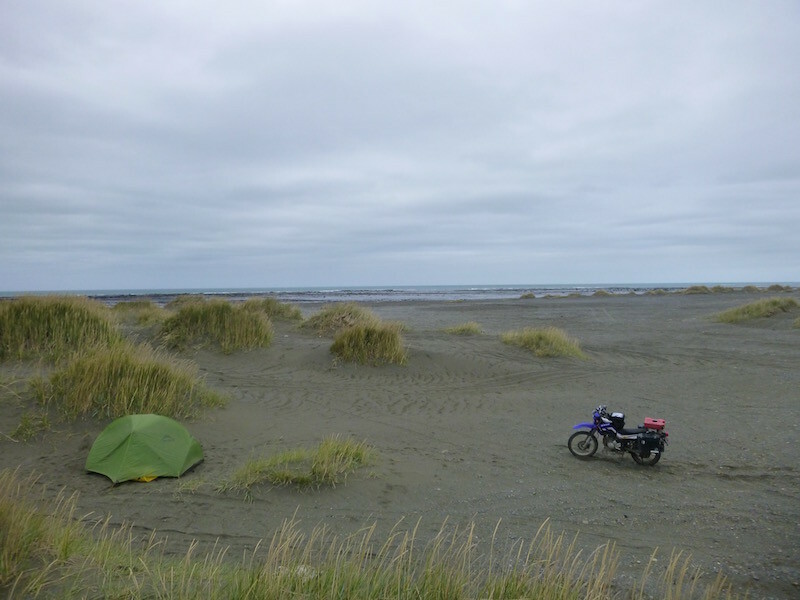 I also use an app/website called iOverlander.com to find campsites and hotels that have secure bike parking. For the most part, ATMs are plentiful and work well throughout Mexico, Central and South America, and are the easiest way to get money these days. Certain banks and credit card companies are better than others about not charging international transaction fees. I will leave that research up to you. I had no problem getting money from ATMs all the way until Chile and Argentina. These two countries dealt me two different problems, one (Chile) easy and one (Argentina) I still haven’t figured out. In Chile, nearly all ATMs, regardless of which bank you are at, are operated under the Redbank name. Just like in the US, you insert your card and enter your PIN, and then are given a variety of choices, including “Balance Inquiry”, “Deposit”, “Withdrawal from Checking”, “Withdrawal from Savings”, “Withdrawal from Credit Card”, etc (in Spanish of course). If you’re like me, you already have this routine down: insert card, enter PIN, select “Withdrawal from Checking”, select or enter amount, take cash, take card, take receipt, go. However, if you do this in Chile, you will inevitably get a “Transaction Denied” response and no money. Here’s the tip: At the Menu Selection screen, typically in the lower left corner, is a selection that says “Extranjero”. Which means “Foreigner”. You have to select this first, then it will take you to a new screen and you can select from where and how much. Argentina is a totally different situation. Nearly every time I approached an Argentine ATM, the first time I inserted my card and selected a withdrawal amount of 1000 pesos (about USD$70), I got a message that said I had exceeded my daily limit. Each time after that if I selected a lesser amount (preset selections on the screen include 700, 500, 400, 300 pesos), I got a message that said I had “entered an invalid amount. Try again”. Of course, I hadn’t entered an amount; I had simply selected one of the choices presented to me. But I never did get any money. And I wasn’t alone. I watched tourists from the U.S., Germany, and Australia achieve the same result and leave frustrated and without cash in several cities. Adding to this is the fact that there are no money-changers or Casa de Cambio places at any of the Chile-Argentina border crossings where I crossed, and no towns nearby. Which makes it even more important that you have Argentine pesos before crossing the border. As one follower mentioned previously, it is possible to exchange money at some stores, even at some gas stations. Example: in Gobernador Gregores, the bank refused to change my Chilean pesos for Argentine pesos, and sent me to the supermarket. The supermarket told me I could buy groceries with Chilean pesos but they would not exchange them outright. Eventually, the service station was the only place in town that would exchange them, and then at a horrible rate. I carry a gas canister (iso-butane-propane) cook stove with me. In researching this trip, I read a lot of information on the internet that said not to use this type of stove, because gas canisters were not available in South America. Which is absolutely untrue. I saw canisters for sale in Cartagena, Quito, Lima, Mendoza, El Calafate, Punta Arenas and many other places, typically under the Doite brand name. Nearly every large city or tourist-based small town had an outdoor or camping store that sold Doite canisters. I must admit I didn’t buy one or use one, as I began my trip with two canisters from REI in the U.S. and these have lasted me this far. If you are traveling two-up or camp/cook more than I did, you may need more fuel. But it is readily available with just a little planning. It remains to be seen if I can find canisters in Africa, but I will find out next month in Cape Town. 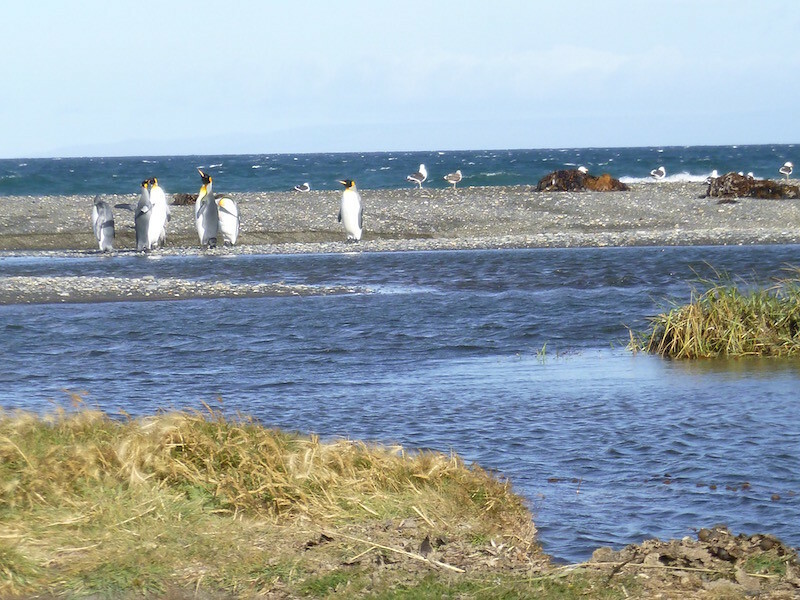 Punta Arenas! Phew….Made it! Then…Oops. Arriving in Puerto Natales in the rain, snow and wind, I made a difficult decision to skip a highlight of this area: Torres del Paine National Park. It’s supposed to be beautiful. And I’m sure it is. When it’s dry, or warm enough to enjoy. Unfortunately, with the very strong winds, rain, and snow (and COLD), it wasn’t my time. 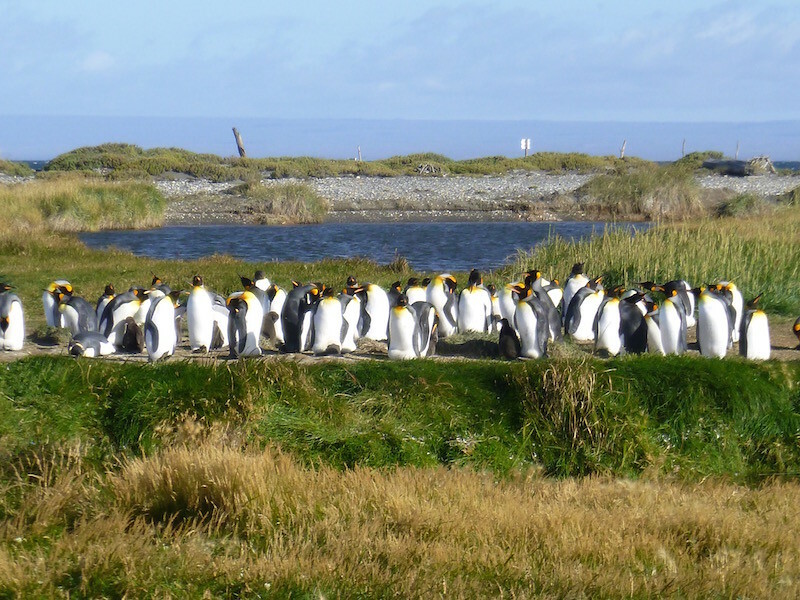 Puerto Natales was completely booked full. I finally found a small backpackers’ hostel with one available bed in a 9×9 foot room with seven other people. I was numb, and my fingers were beginning to feel like frostbite, even with the winter gloves and the heated grips, so I took it. The next morning the sun was out but the wind was already blowing hard and it was still in the upper 30s as I headed towards Punta Arenas. My front tire was to the point that I was stopping every ten to fifteen miles to inspect it, looking for any signs that the tire was beginning to fail. The two side-by-side knobs in the center had worn smooth with the carcass of the tire. 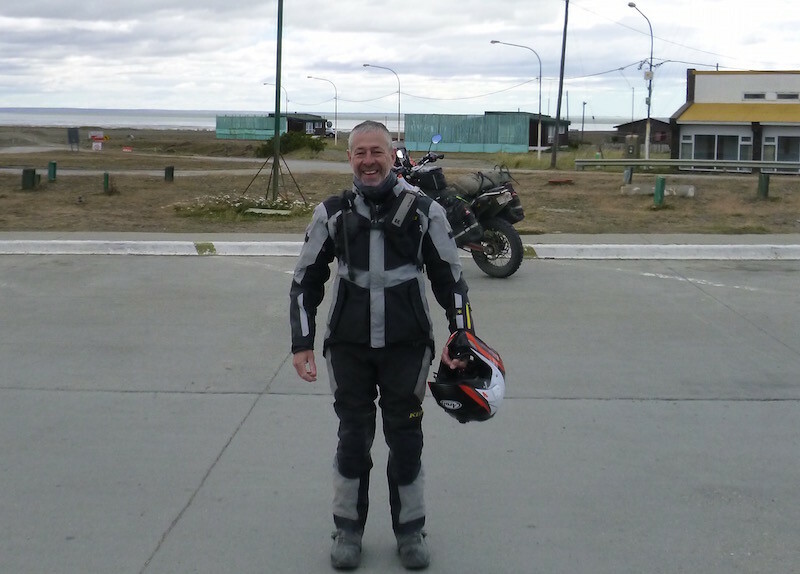 I stopped about halfway to Punta Arenas in Tehuelche for a cup of coffee to warm up. Very nice lady in a cafe and I was her only customer. About thirty minutes later a bus pulls up, full of Greek tourists. As usual, they were curious about the crazy Texan on the small motorcycle. We talked briefly, wished each other “Buen Viaje” and we all took off for Punta Arenas. I eventually made it, with my tire still intact. Once again, the town was fully booked, but I found a campground just north of the airport. I am completely baffled as to why this campground was totally vacant. Yes, there was some trash there, but not terrible, and not everywhere. I chose a spot away from the trash, with decent wind protection, and set up camp. 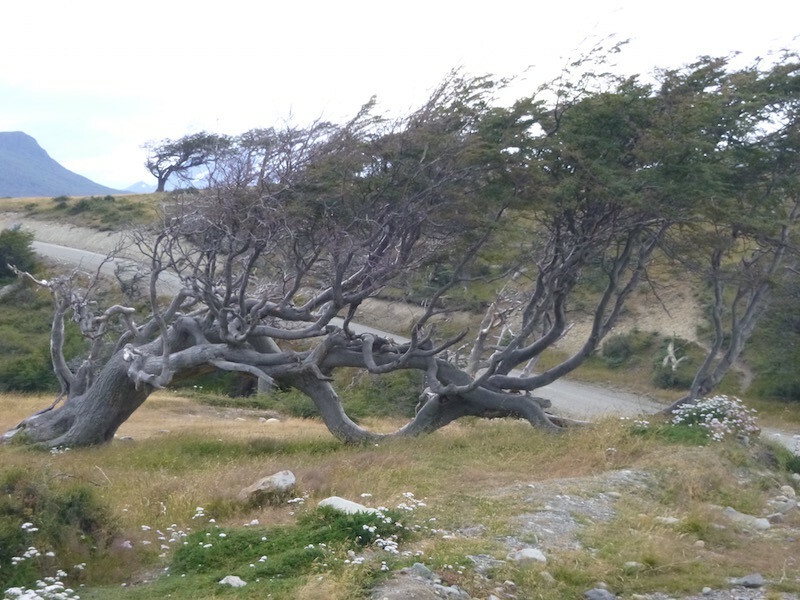 Easy to figure out which direction the wind blows here: look at the trees. 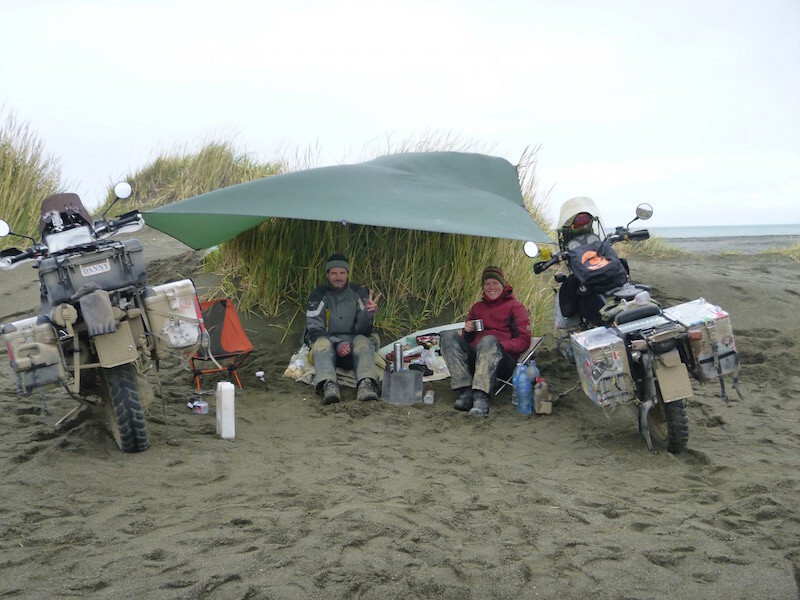 Then park the motorcycle facing directly into the wind so it hopefully stays upright, and set up the tent so the doors are not facing the wind. And use ALL of the tent stakes. Notice that the picnic tables only have benches on the upwind side. Nobody wants their food blown into them while eating. 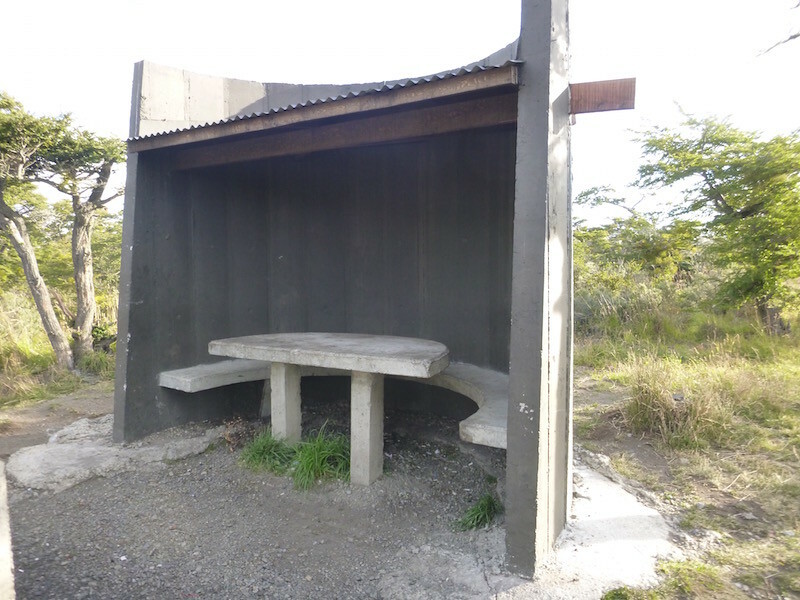 All of the shelters face the same direction, for obvious reason. In the morning, I climbed out of my tent and looked around. I was still the only person in the campground. Odd. But enjoyable. Definitely no complaints from this hermit. I headed into town to get new tires. Unfortunately, a bit of searching the day before revealed that tire choices were much more limited than I had hoped here. The Yamaha dealer had nothing but true MX tires; not road worthy. The Honda dealer had one Pirelli MT90 front and no rears. 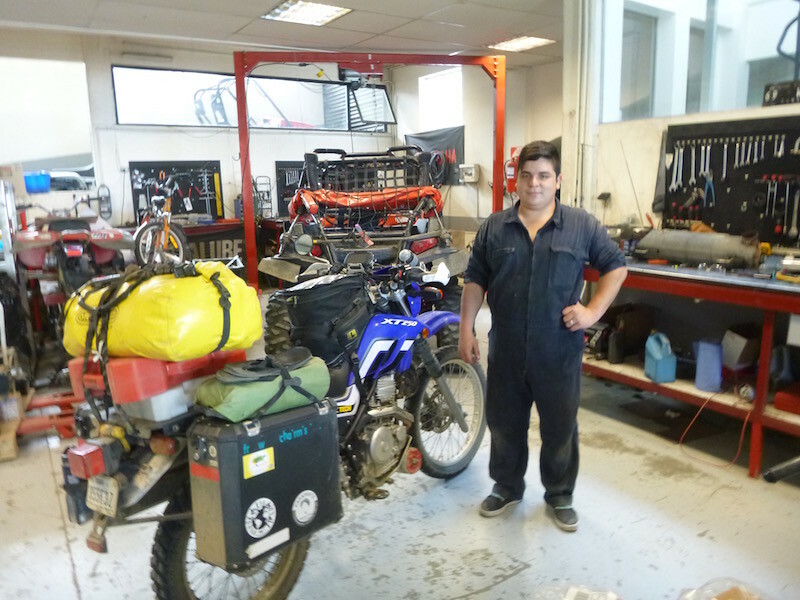 The main guy in town, Alejandro Lagos, is fairly well known in the adventure touring world, and I went there first. He also had no Pirellis; he mainly deals in Heidenau tires for the big BMWs. But he had a couple of Heidenau tires that would fit my bike: a K60 rear (good) and a K76 front (not as good…more of a street tire than off-road). At this point, I couldn’t be too picky. 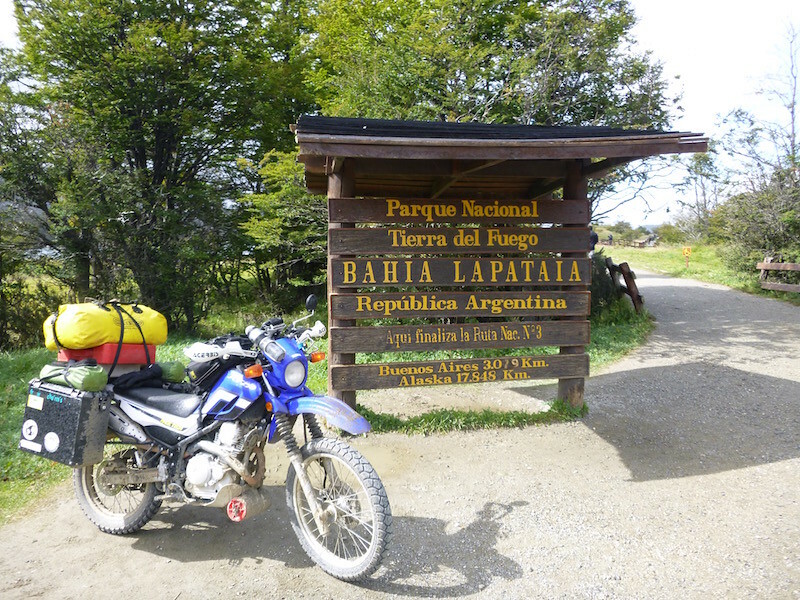 I needed to get to Buenos Aires, and the last of the gravel was between here and Ushuaia (I think). So I agreed to those tires. Bike up on the lift, rear tire done, front tire being changed. Photo taken just before disaster struck. I was sitting on a bench just to the right of where this photo was taken. Suddenly I heard a loud crash. When I looked toward the bike, my mind had trouble processing what I saw. My bike was completely upside down, wheels in the air, license plate upside down. Adrenaline kicked in and I ran over to help (in hindsight I wish I had taken the time to pull the camera out of my pocket and take a photo). The bike was still strapped to the lift, and the lift was on its’ side next to the bike. It eventually took three of us to lift the bike enough to get the pannier out from under the lift so we could lower the lift and then lift the bike back up onto the worklift. My GPS was gone; it had made first contact with the concrete, along with the mirrors, the right side of which also exploded on impact. Brake fluid was leaking onto other components from the front master cylinder (that happens when a normally highest-point vent becomes the lowest location on a master cylinder). The right handguard was bent, the exhaust shield was dented, my Garmin gps dock was in two pieces. Things were basically a mess. But of course, it could have been worse, and I kept telling Alejandro that: he could have been under it when it fell. It could have been a $20,000 BMW covered in brittle plastic. Nothing broken was preventing me from continuing my trip. He was very apologetic and clearly felt terrible. I suppose I should have been more upset, but a lot of things have changed since I began this trip. It’s just a bike. It’s mechanical. It can all be fixed. And of course, I’m about as low-maintenance as they come. He definitely got lucky in many ways. I pulled out the new Garmin Montana that I have been carrying since January, and installed it. Alejandro looked for a replacement mirror, but had nothing with reverse threads (a Yamaha thing). He offered to order a new mirror for me from Santiago, but that would take days and I wouldn’t be here. I still had a left mirror. I could still ride. I did eventually get a discount on my tire change…probably not as much as I should have considering the expense of the gps dock, but what’s done is done. After my morning excitement, I decided it was a good day for a day off. 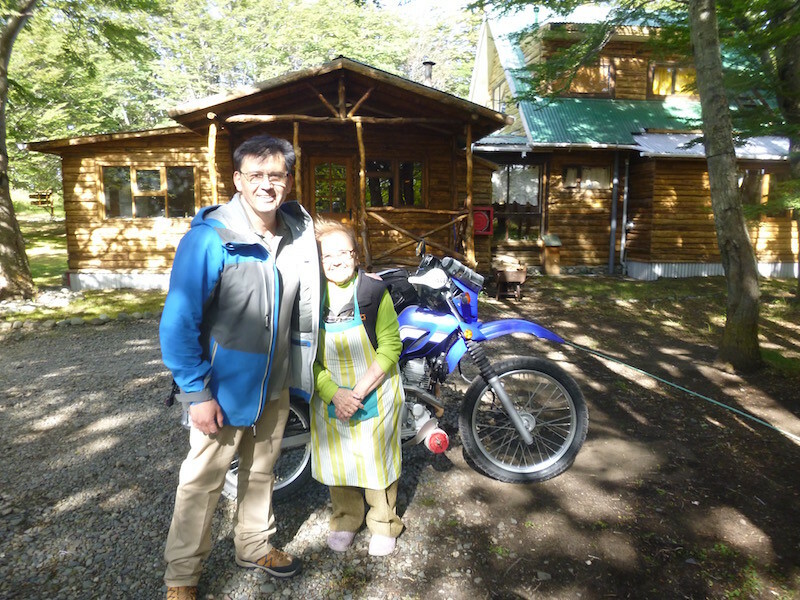 I rode out to my lodging for the night…a beautiful place in the woods north of town run by an incredibly nice couple and his mother (of course they are nice…they are Chilean). Tomorrow I hope to do some sightseeing and relax a bit more before my last two days of venturing south. Yes, that is snow. Big flakes. 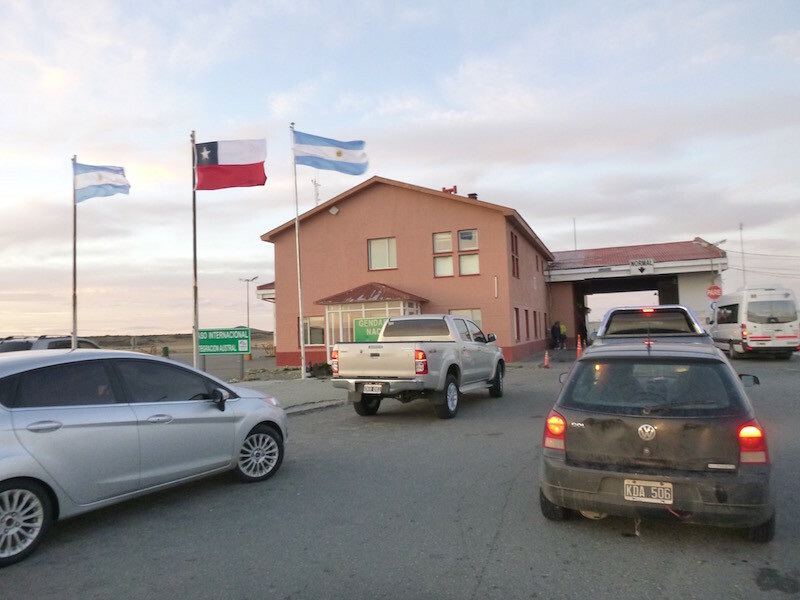 Paso Dorotea border crossing, just before Puerto Natales, Chile, Tuesday, Feb 16 (middle of summer in the Southern Hemisphere). 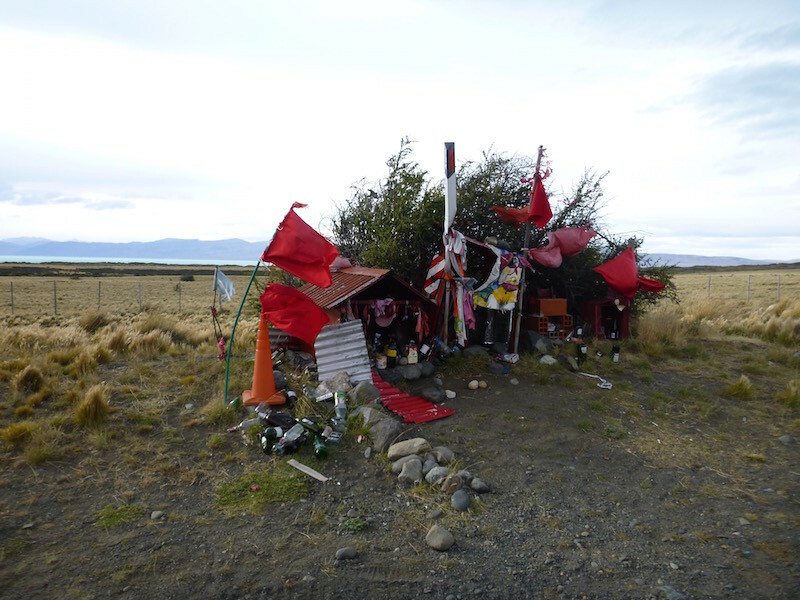 Sandy had posted a question in the last couple of days asking if I had seen any of these red roadside memorials in Argentina. The answer is Yes, they are everywhere. They usually have a large number of red flags posted on and around them. I had no idea what the significance of them was, until Sandy asked about them, so I asked her to research it. 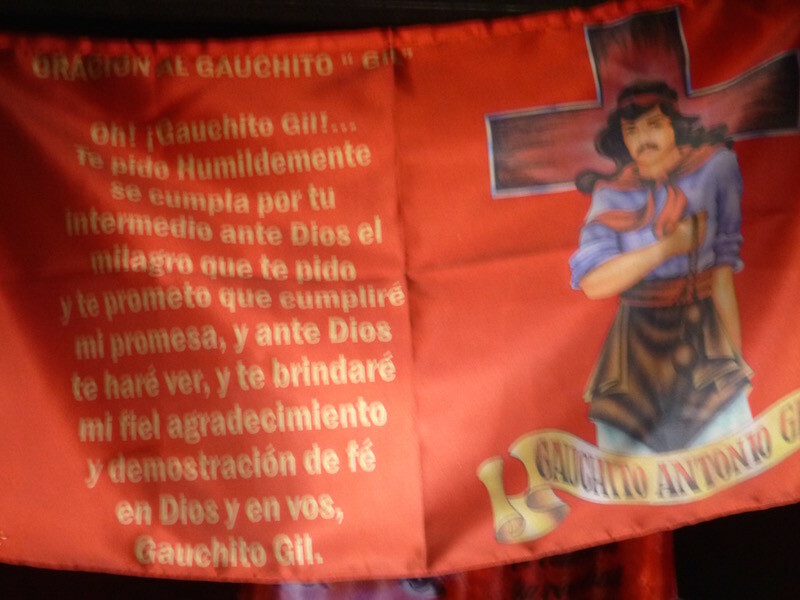 Here’s some more information on the story (and legend) of Gauchito Gil. Many of these memorials also have a large number of water in bottles, as well as other beverages, placed in offering to Gauchito Gil. 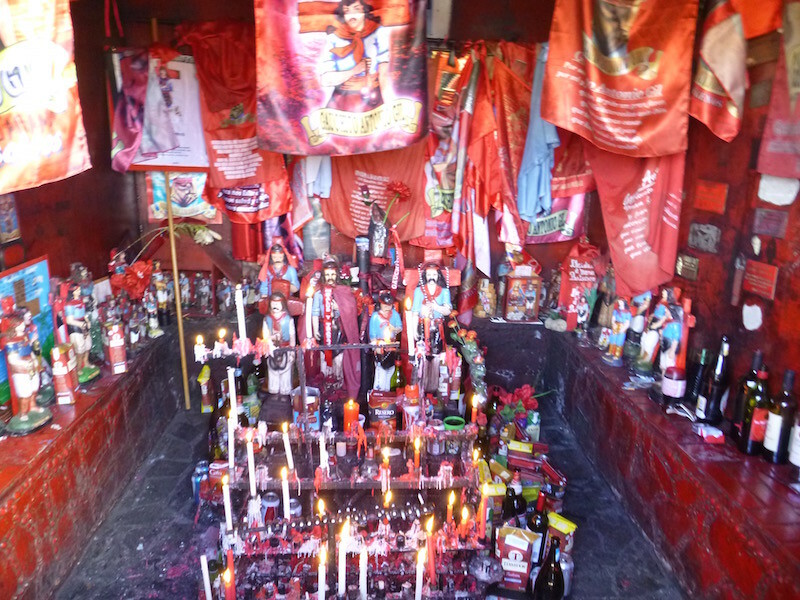 I’m sure there’s more to the whole story yet, but it seems Argentines enjoy celebrating this defacto saint. 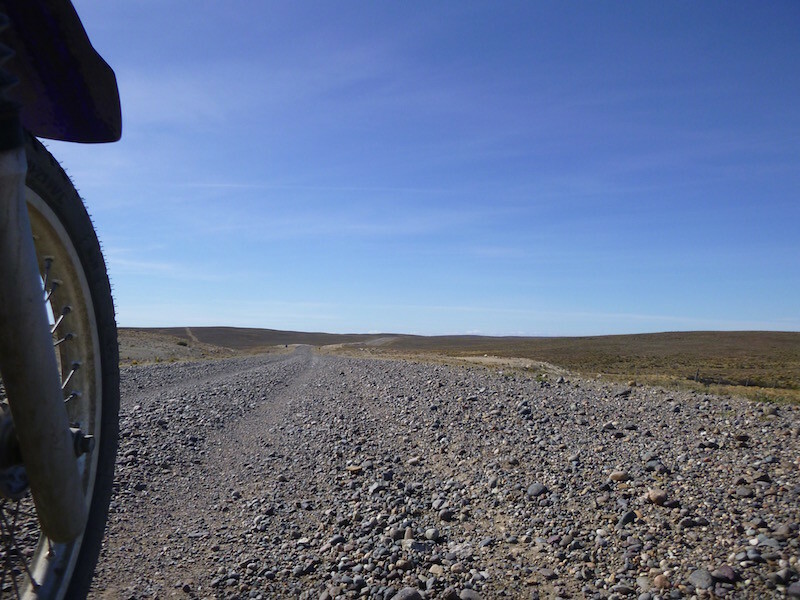 The ride from El Chalten to El Calafate is all paved, and relatively short at around 130 miles. 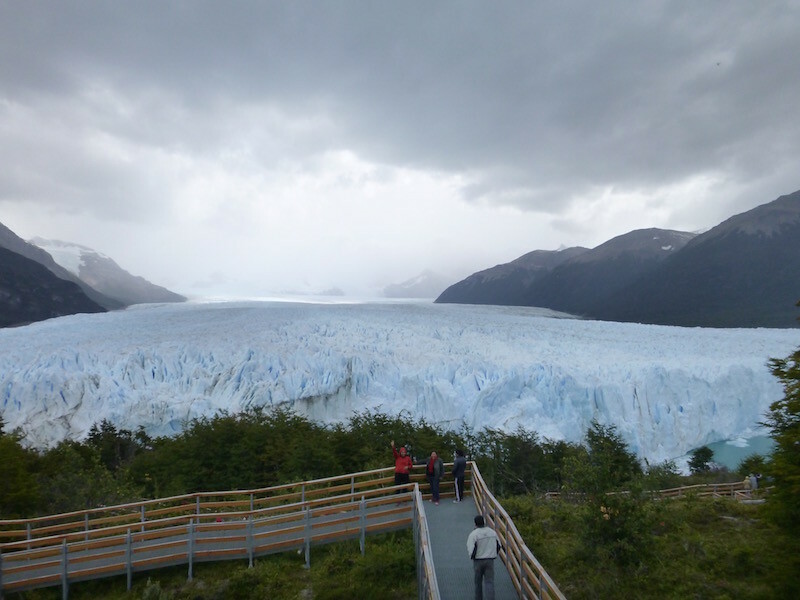 The Perito Moreno glacier is another 50 miles west of El Calafate, so add another 100 miles round trip to the glacier and back to the hotel in El Calafate. Still a fairly easy day. 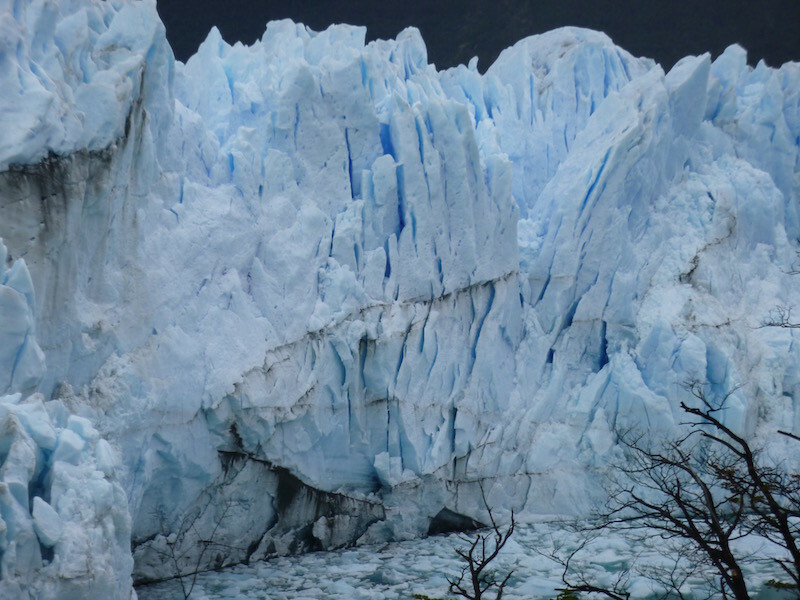 There are two parts to the Parque Nacional Los Glaciares: the Northern part of the park includes El Chalten and Mt. Fitzroy, as well as the Glaciar Viedma on Lago Viedma. This glacier is over a mile wide at the point where it enters the lake. 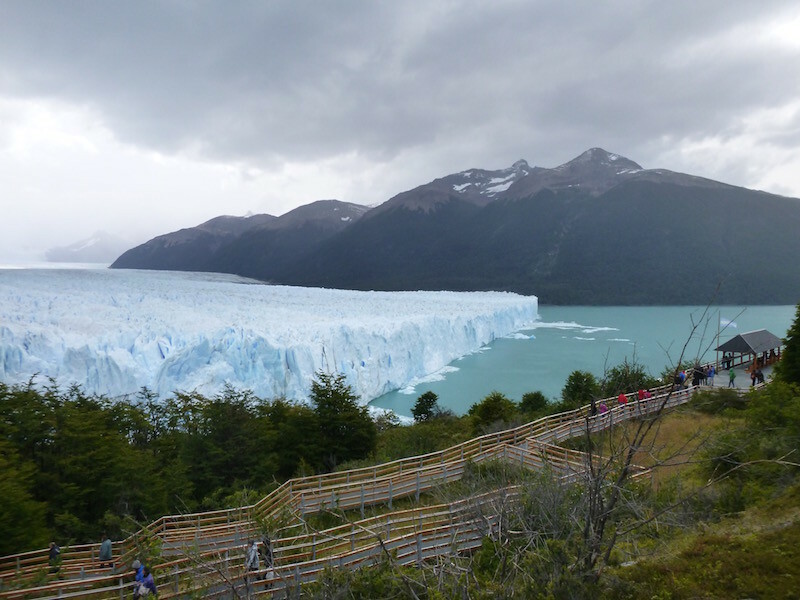 The Southern part of Los Glaciares includes the Perito Moreno Glacier, on Lago Argentina. 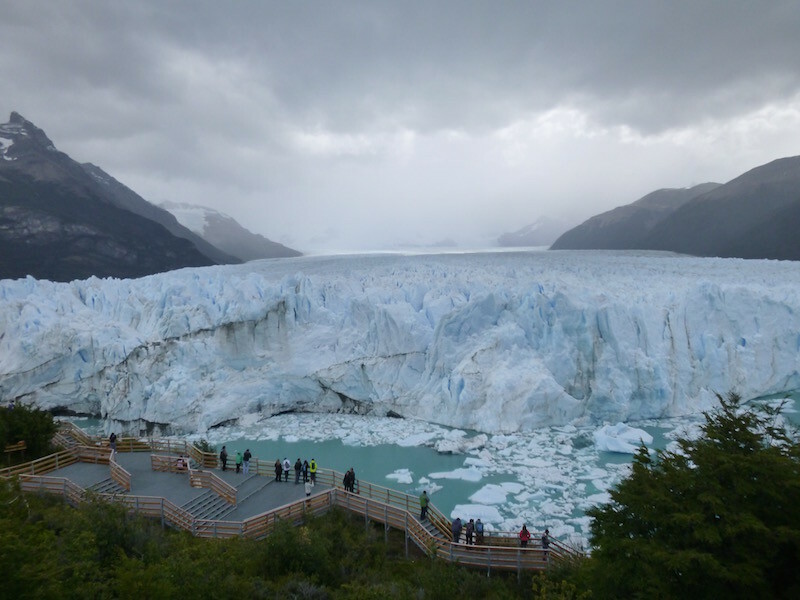 This glacier is three miles wide and stands 240 feet tall where it enters the lake, and is 19 miles long overall. 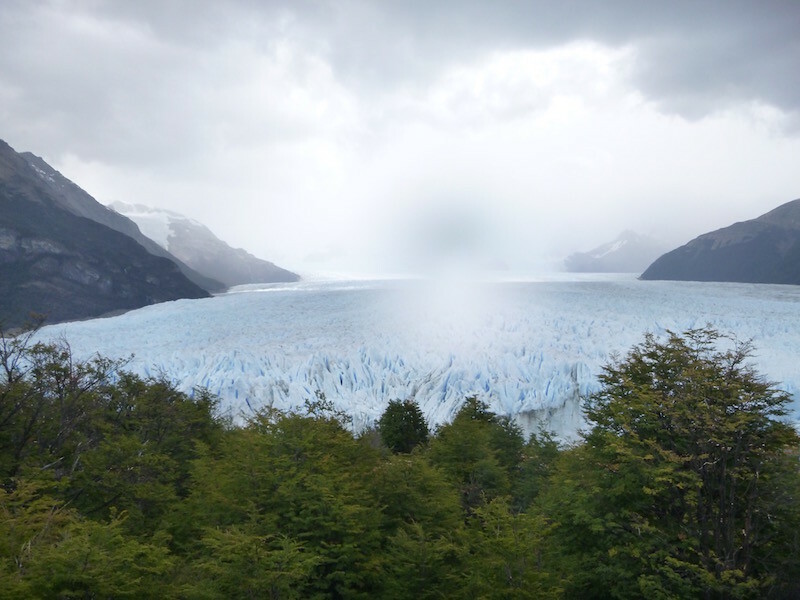 Both of these glaciers are part of the Southern Patagonia Ice Field, the third largest supply of fresh water in the world. 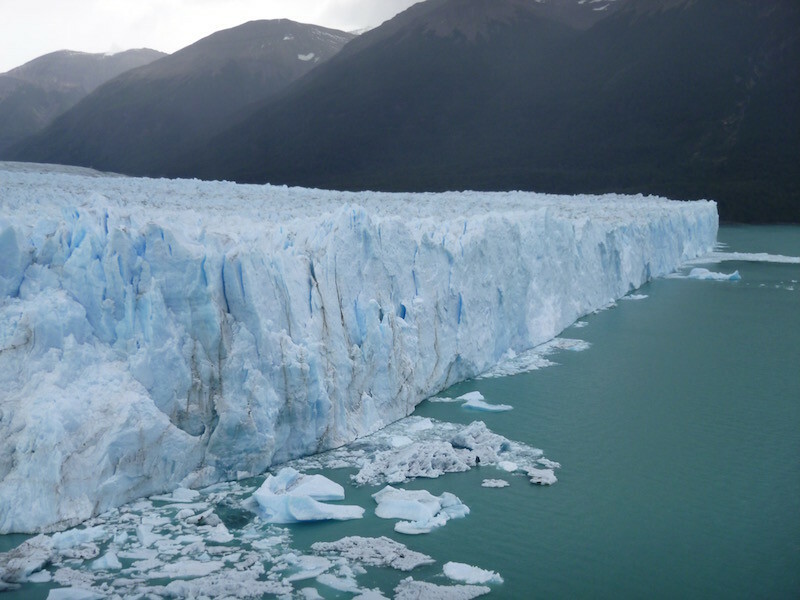 Perito Moreno is one of only three Patgonian glaciers that is actually “stable” or growing and not receding. Every 10 minutes or so you hear a loud “crack” and then a canon-like sound. The canon is the chunk of calved ice hitting the water. It’s hard to get a handle on the size of these things: some of the chunks I watched break off and hit the water were larger than an 18-wheeler. 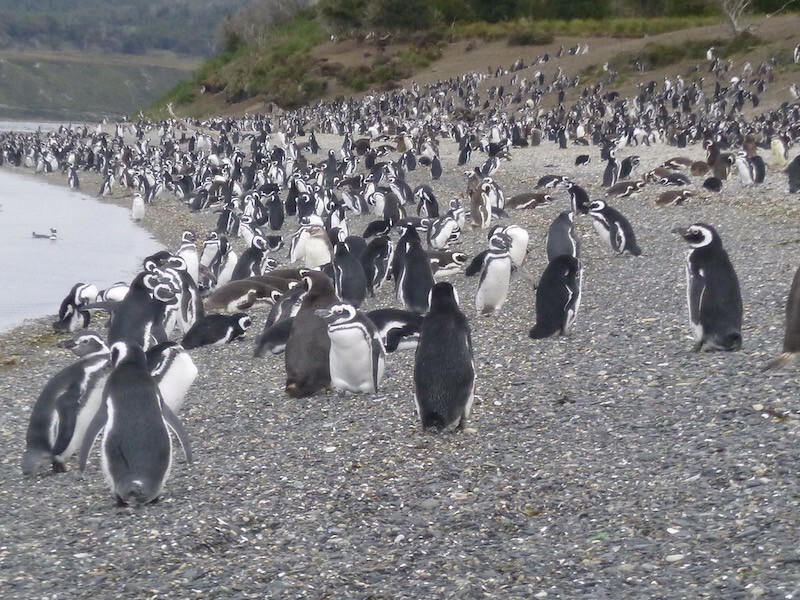 This area is one of Argentina’s premier tourist destinations, and it’s high season here. This is killing my budget, but thankfully I spent a number of nights in the tent up til now. 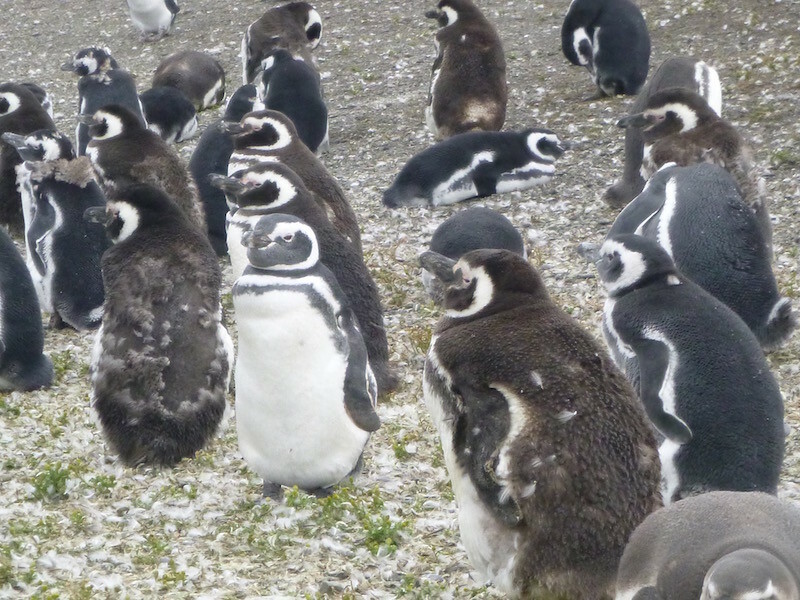 Most places are fully booked, but I was able to find a hotel in El Calafate for $70 a night. There is also a huge music festival going on in town this week and next, and there’s no need to buy a ticket because my room is close enough to the stage that it might as well be on it. I stumbled on Daniel and Josephine again yesterday as I was returning from the glacier, and we ended up meeting for dinner last night. 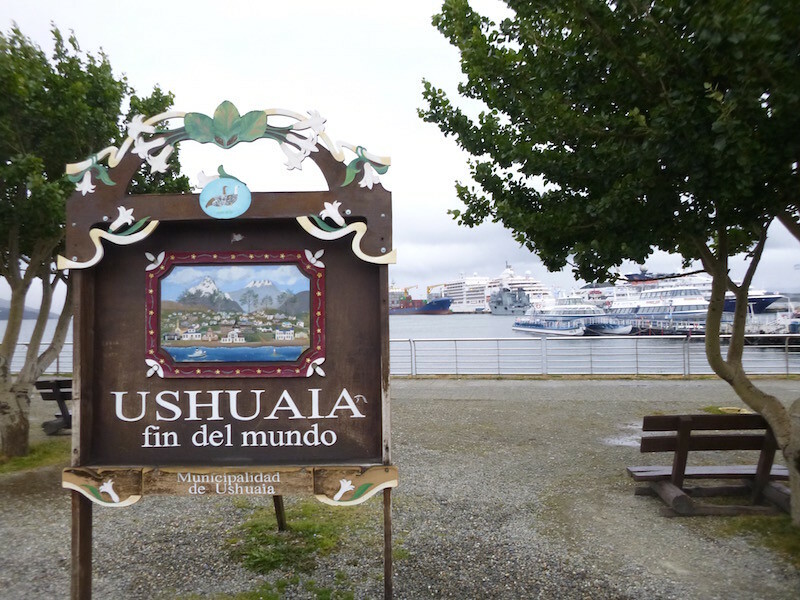 As Daniel said, we are approaching the “bottleneck” of adventure tourists headed for Ushuaia at the peak season, so I’m sure I’ll run across them as well as others as I continue south. Today is a “down day” as I do a little maintenance and shop for a new phone (not sure I’ll buy one but will look anyway; they aren’t cheap here. But then I don’t really need a phone anyway…it’s the apps I miss. Perhaps I can substitute my iPad for a while….Hmmm. Will have to explore that idea. 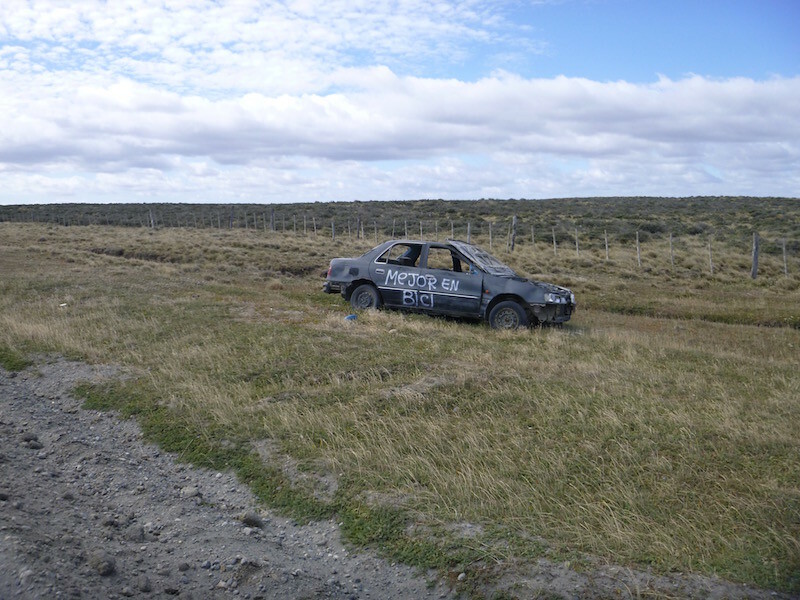 The tires look like they might make it to Punta Arenas after all, so will continue to keep an eye on them (especially the front, which is wearing very oddly), and cautiously do the last 350 miles to the bottom of the world. 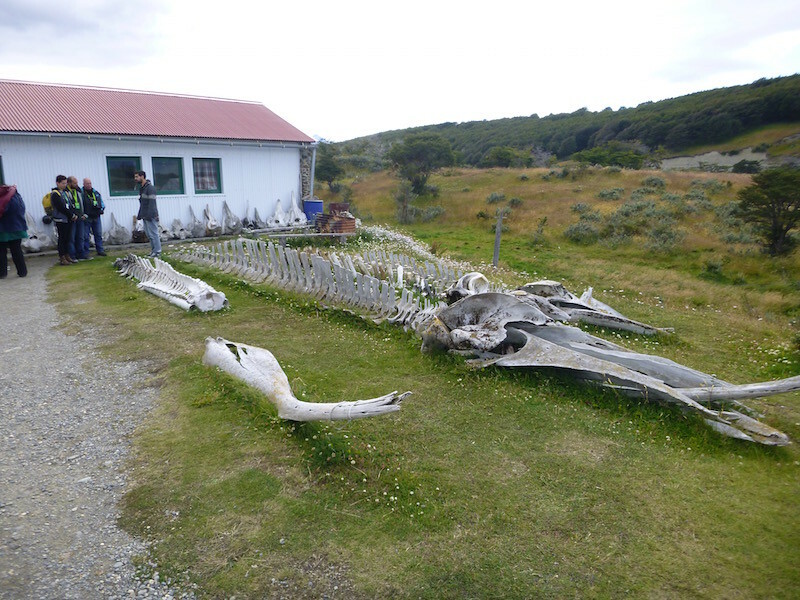 On to Puerto Natales tomorrow.